Piper Aircraft was founded in the late 1920s with an eye toward building planes for general civilian use. From 1938 to 1947, Piper sold nearly 30,000 of their relatively inexpensive J-3 Cub models, making the plane one of the most ubiquitous non-commercial planes soaring over the United States by the mid-20th-century. 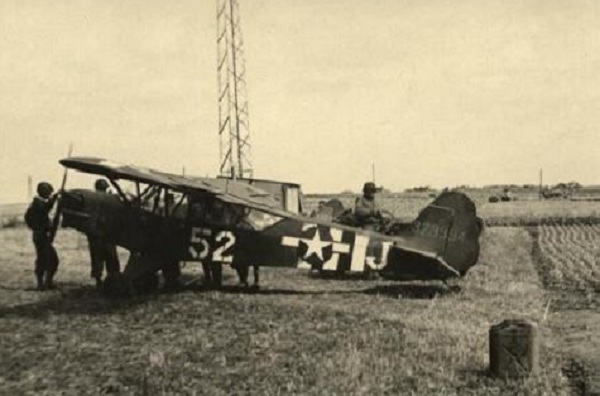 During World War II, Piper supplied the US Army Air Forces with nearly 6000 of their J-3 Cub planes in a modified military version known as the L-4 Grasshopper. The main modification of the light plane was the installation of wide banks of plexiglass windows, making it usable as a radio observer and reconnaissance plane during key missions like the Allied invasion of Normandy in June 1944. The Grasshopper also found varied service transporting supplies to the front, carrying wounded to the rear and ferrying military and political dignitaries. In rare cases later in the war, the plane was also equipped with light weapons for use as an air-to-ground attack platform. My modelling for Flames of War has been focusing as of late on filling in some odd little gaps in my forces. Since I run some US artillery from time to time, adding an air observation plane not only allowed me to add to my gaming but also take a break to model another plane. This time around I also decided to pay a bit more attention to basing my plane to add a bit of visual interest to an otherwise simple model. I like the quick work on the base so much that I’m going to go back and add the same to my US P-47 Thunderbolt and British Hawker Typhoon models. While relatively inexpensive and easy to assemble and paint like my other aircraft, my one criticism of the FOW Grasshopper model is the lack of decals. Even with the one shortcoming in markings, my new Grasshopper will be a welcome addition to my FOW games. In most American army lists, adding an AOP is a cheap point spend while also greatly expanding the effectiveness of the already devastating US 105mm howitzer battery. 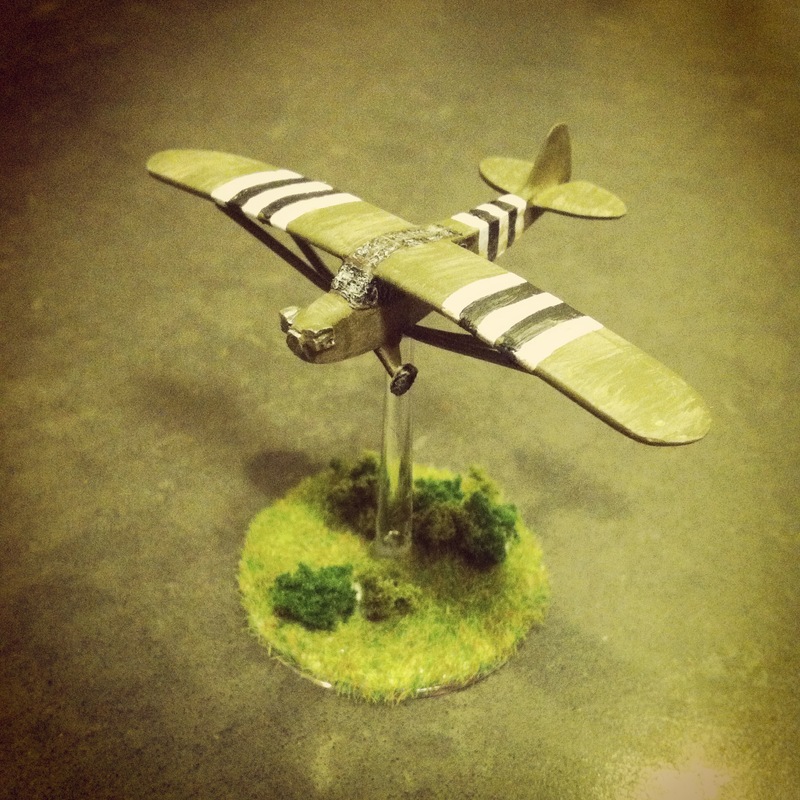 Getting this little plane zipping over the heads of my Axis opponents on the tabletop battlefield may not prove to be a total game changer. It is, however, going to give the enemy one more thing to worry about and may just provide an edge like this classic of American engineering did some 70 years ago in the skies of Europe. Although actually made up of a number of battles and assaults during World War II, the post-D-Day breakout actions by the Allies in late 1944 in Northern France has become commonly known as the Lorraine Campaign to military historians. Frustrated by poor weather conditions and weak supply lines, the General George Patton’s 3rd Army push into Germany eventually led to the wintery and more famed German counteroffensive with the Battle of the Bulge in the winter of 1944-1945. 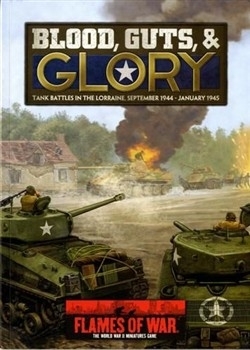 Flames of War offers a book outlining the Lorraine Campaign with Blood, Guts and Glory. US lists in the book focus on the powerful tank and armored rifle companies which made up the steely backbone of Patton’s daunting force. 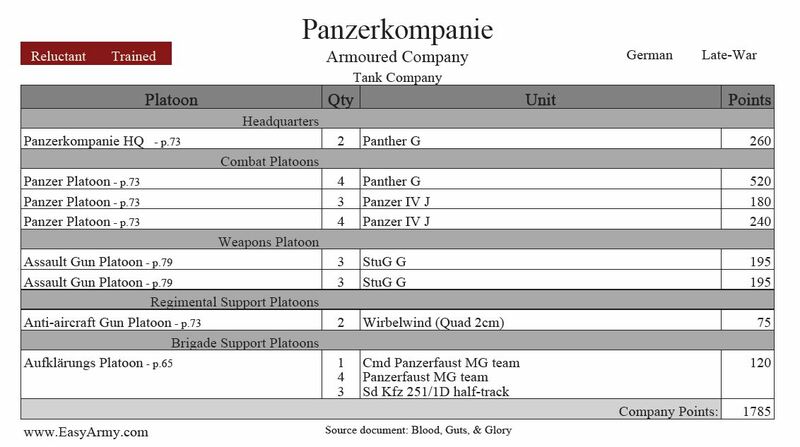 For the Germans, the cobbled-together 106 Panzerkorps Felderherrnhalle and 111 Panzer brigade are outlined with forces full of some of the best Late War armor and equipment albeit under somewhat challenging motivation and experience ratings. 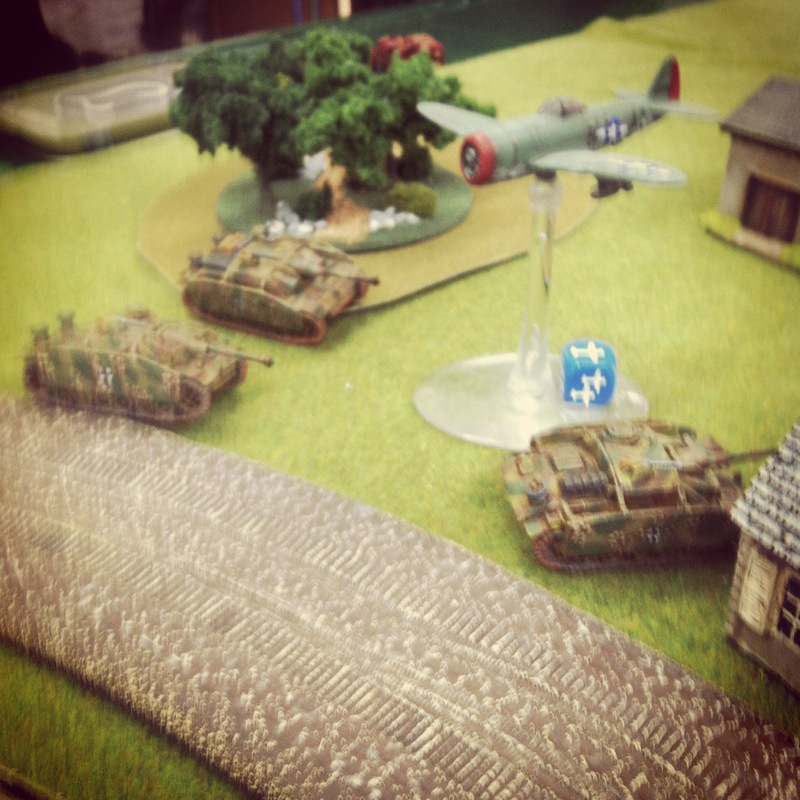 A couple of weeks ago at Metropolitan Wargamers in Brooklyn, NY, two of us had a go at a fictional battle set during the Lorraine Campaign. We play against each other a fair amount, and both of us were looking to switch things up commanding some very different forces. 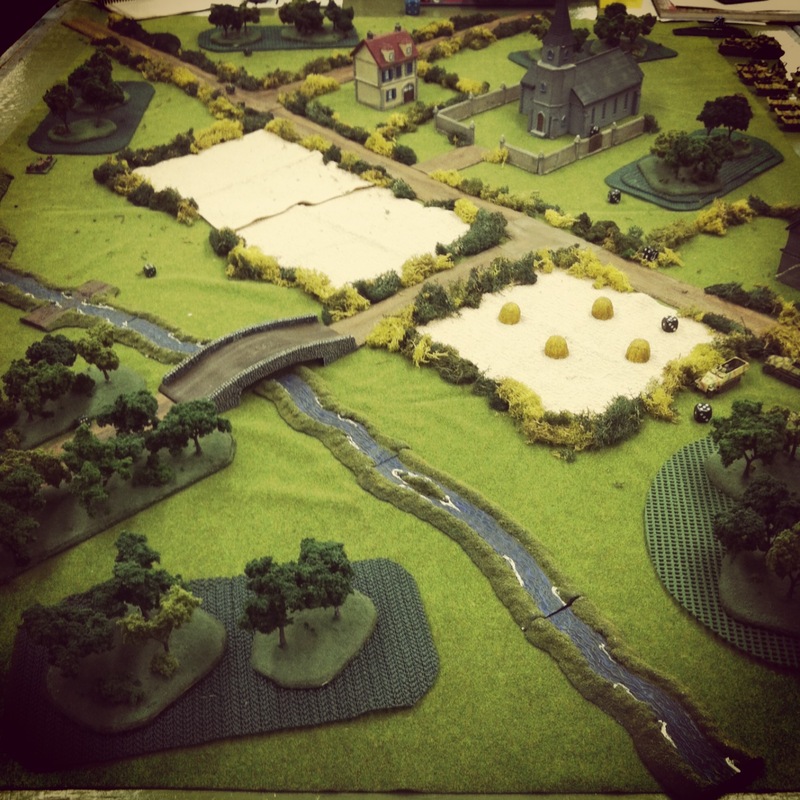 The tabletop terrain was also different with a more open battlefield lined with fields, woods, gentle hills and two farms. All of this was quite a departure from the games we have most played set in the days and months after the Normandy Invasion in June of 1944. My opponent’s Panzerkompanie was full of armor – Stugs, Panthers and Panzer IVs – and supplemented by an Aufklärungs platoon and a couple Wirbelwinds to chase away any US aircraft. For my US force, I wanted to try out some underused rifle platoons which were supported by 105mm M7 Priests, some Shermans and a P-47 Thunderbolt buzzing overhead. We also chose a different game framework, opting for a somewhat complicated Dust Up scenario from the official Flames of War missions list. Well, as the game played out, I quickly discovered I had brought infantry to a tank fight. With one of my infantry platoons camped out in the woods near two objectives, my hope was to stave off the German armor advance with repeated bombardments from my Priests and diving runs from the P-47. Things went well for me in the early stages as Panthers stalled moving through the woods. A Wirbelwind and two Panthers were subsequently destroyed from 105mm volleys , but my P-47 failed to get any traction in stopping a group of Stugs creeping along the table edge. Even so, a couple turns in I was feeling fairly confident my artillery fire would whittle away the rolling German advance. My plan fell apart as the first German Panzer IV reserves came on the table at the corner behind my Priest battery and made quick work of the nearly-armorless US mobile artillery. I swung my surviving Priest and supporting Sherman around and engaged the Germans at close range with direct fire, but succeeded in only cracking open one German tank. In another turn, the Priests were wiped from the board and only my infantry platoon remained to defend my end of the table. 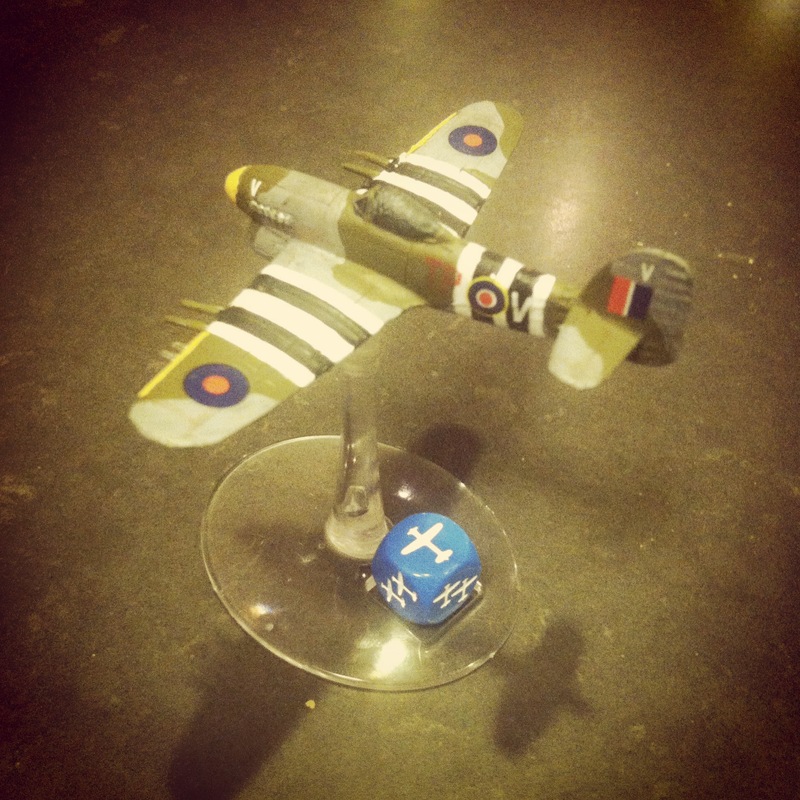 The P-47 appeared again to control the center of the battlefield, but missed on its run. The US center and flank were crumbling by the time turn four approached. 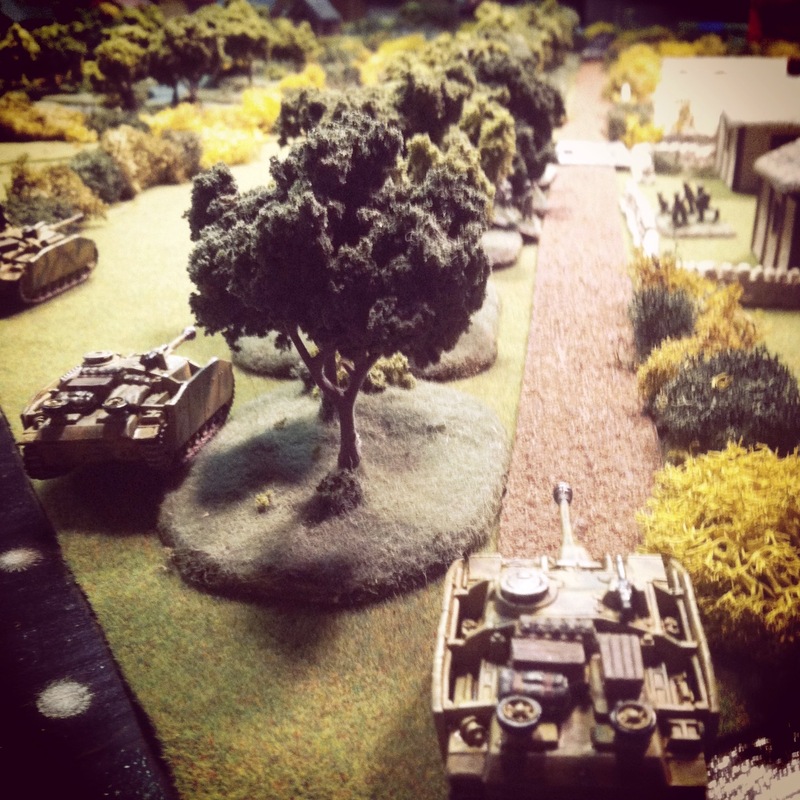 My reserve Shermans came on the table near a farm and quickly engaged with the Panthers which swung to meet the US armor advance. 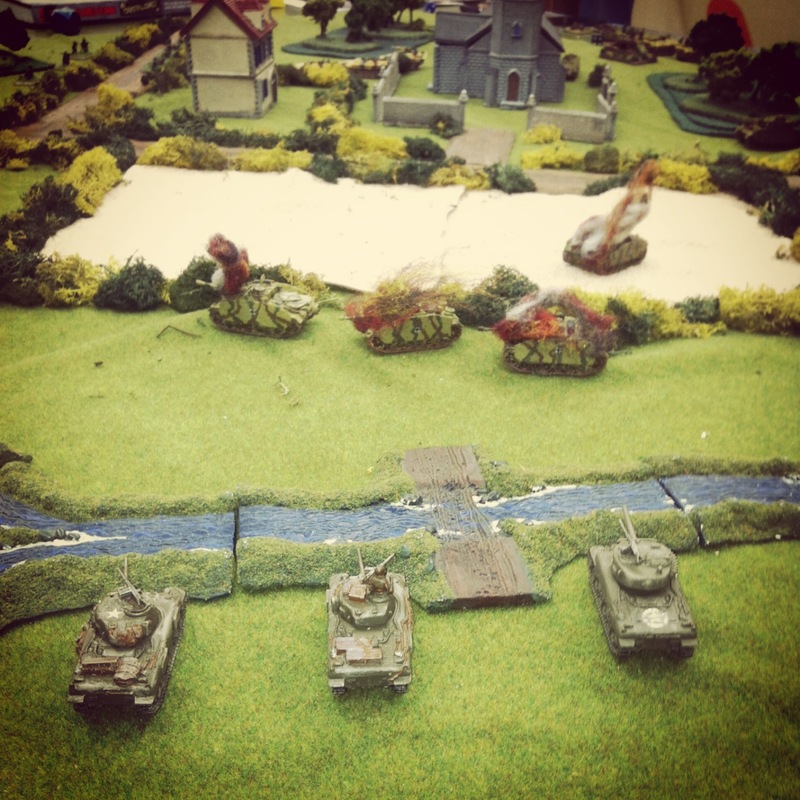 Shots from my heavier 76mm guns lit up a Panther and bailed another’s crew. The German tanks returned fire, destroying all but one 76mm Sherman as more Panzer IVs showed up with the Aufklärungs platoon close behind. In the fifth turn, my final supporting infantry platoon arrived in their halftracks, dismounted and made a desperate run for an objective in the open field. The infantry on my side of the table also broke from the woods in a last-ditch assault on a mass of German tanks creeping toward an objective but were repulsed. 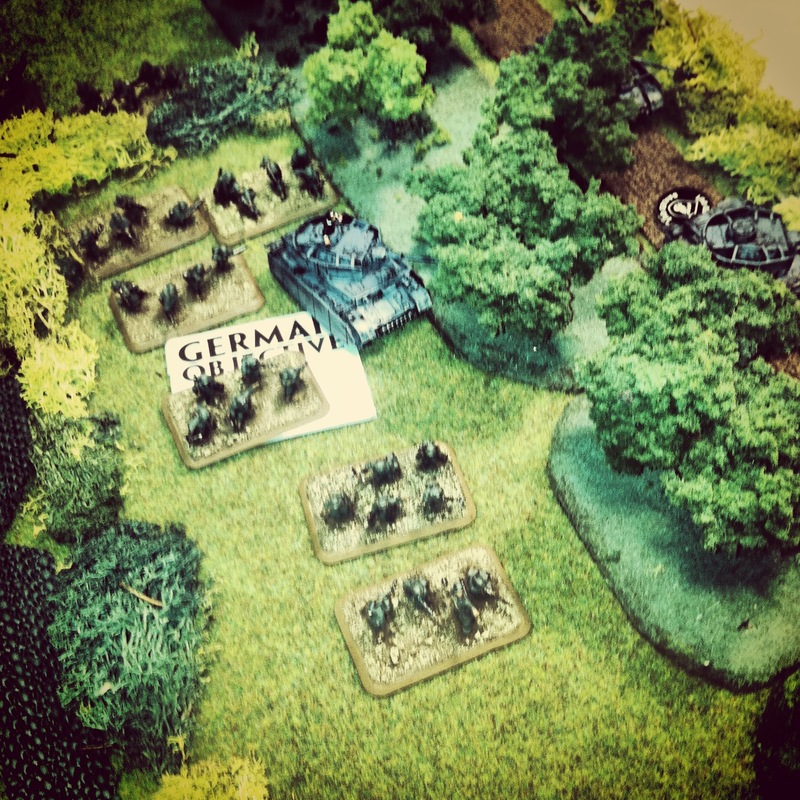 With German armor swarming an objective, the game went to the Axis. Clearly, my US plan from the outset was a stretch. Had I taken the more historic approach of Patton in the Lorraine Campaign of 1944, a fully-armored US force may very well have stood a fair chance against all the German tanks shuttling here and there on the tabletop. Balancing history and what-ifs is what makes playing Flames of war so engaging over and over again, but next time I’ll be careful not to second-guess the command decisions made in Northern France some 70 years ago. 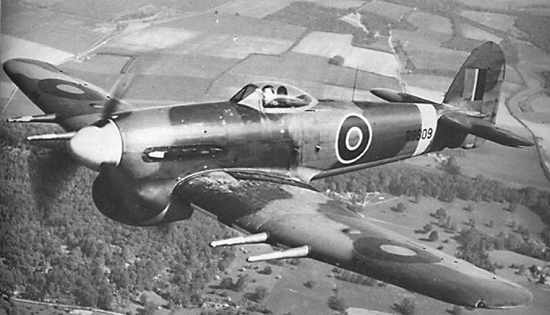 The story of the British Hawker Typhoon in WWII is one best told in two acts. Its early use beginning in 1941 met with very mixed service results against superior planes in the German Luftwaffe and production of the plane was nearly scrapped by the Royal Air Force. However, with a bit of re-purposing, the Typhoon’s speed was soon coupled with increasingly-heavy bomb payloads to become an effective fighter bomber against ground targets. In 1943, the Typhoon really came into its own when armed with wing-mounted rockets and fuel tanks providing greater flight range. While of questionable effectiveness against tough-armored German tanks, a run from a squadron of Typhoons with rockets firing struck fear into German forces and devastated supply lines and production facilities in Western Europe. The Typhoon’s role in D-Day, Operation Goodwood, Operation Varsity and other engagements was both disruptive and deadly in support of ground campaigns all the way to the war’s end. 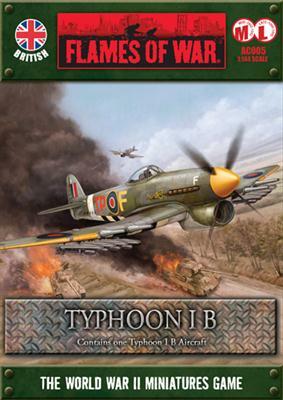 Flames of War offers a model of the Typhoon as well as a short online guide to painting their model. With my British ground forces fairly well built out with artillery, tanks, infantry and support weapons, adding some air support seemed to be the next natural step as well as another interesting modelling project. I picked up my model online at a slight discount online and went straight to work. I painted the plane in a RAF grey and green camouflage pattern with yellow details to the nose and leading wing edges. Next, I added black and white “invasion stripes” which had been used on Typhoons since earlier in the war, although my plane was going to be flying over late war Normandy. The decals included with the kit finished off the plane with “V” markings, subtly allowing me to add my own initial to my completed plane. Finally, a little watery rusty brown wash brushed along the seams in the fuselage added a weathered look of many previously-flown missions. 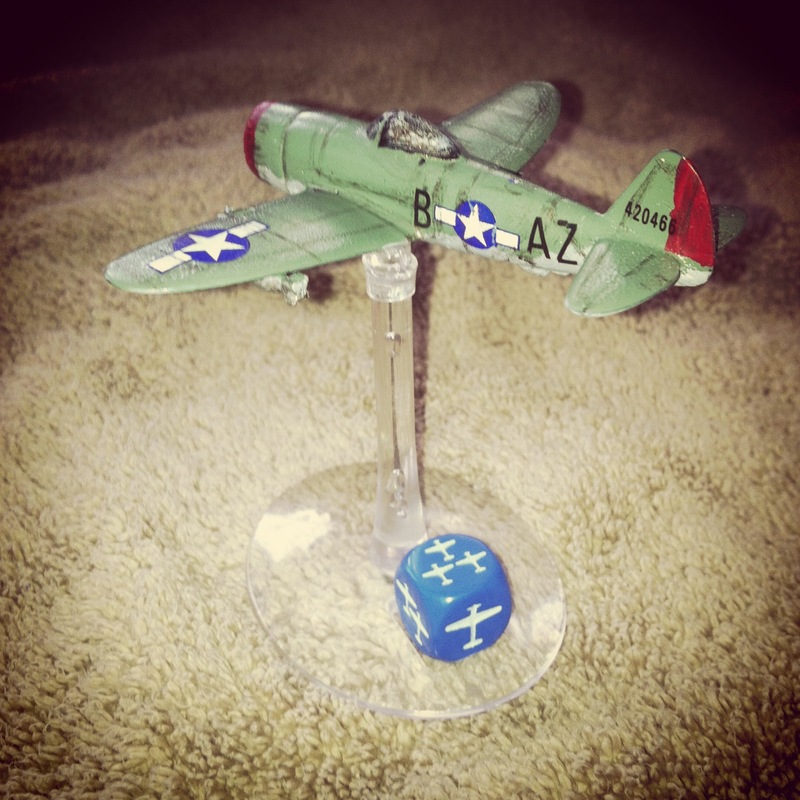 With my existing American P-47 Thunderbolt, having the Typhoon in my miniature Allied arsenal is sure to add more depth and choice to my Late War Western Europe gaming. With the Typhoon hitting the table in the near future, my hope is its presence above the battlefield will rain rocket-fueled terror and distraction on my German opponents just as they did over Europe some 70 years ago. When most people think of the D-Day invasion at Normandy on June 6th, 1944, the deadly images from the US landings at Omaha Beach in popular movies like The Longest Day or Saving Private Ryan generally come to mind. Utah Beach was added as an objective for US forces late in the invasion planning and occupied the far right of the Allied coastal assault. The beach was divided into three sectors (Tare Green, Uncle Red and Victor), and the landing of some 23,000 troops and armor support started the day’s invasion at 6:30am. Awaiting the invasion was the German 709th Infantry Division. The US 4th Infantry Division at Utah Beach, including Gen. Theodore Roosevelt Jr. and author J.D. Salinger, came ashore with relatively few US casualties of just 400 compared to the 3000 at nearby Omaha Beach. The success of the assualt is credited largely to the effective landing of more Sherman tank support, relatively light German fortifications covering the exits from the beach and early inland actions by the 101st and 82nd Airborne Divisions earlier in the morning. 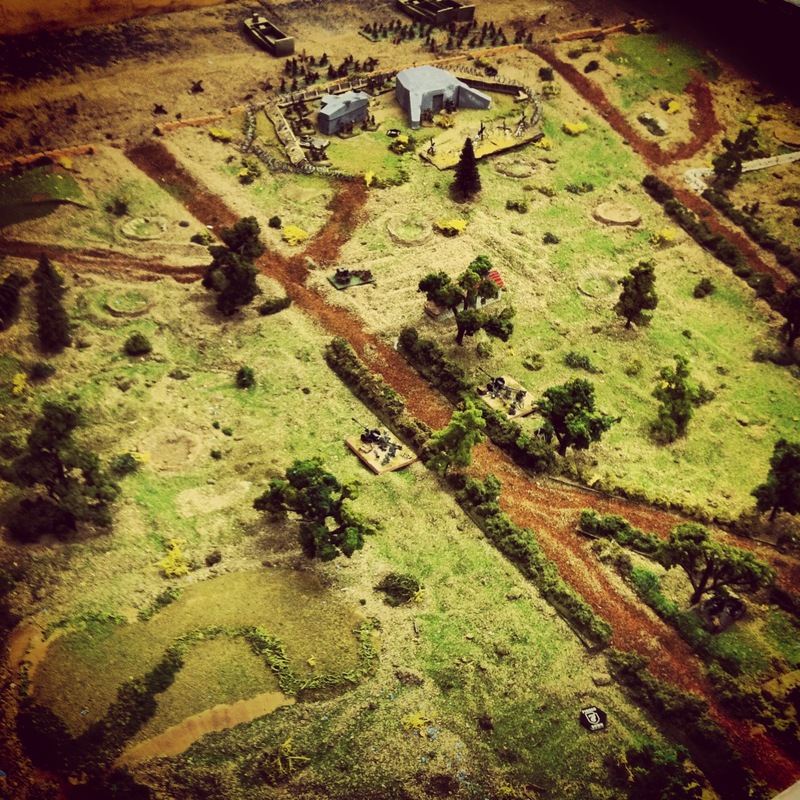 Metropolitan Wargamers in Brooklyn, NY is pretty well known for the sand tables which occupy our space, and some of our founding members have won several awards for presenting sand table games at conventions over the years. Sand tables have been used by military planners since ancient times when sticks and stones were simply laid out in the sand on the ground. 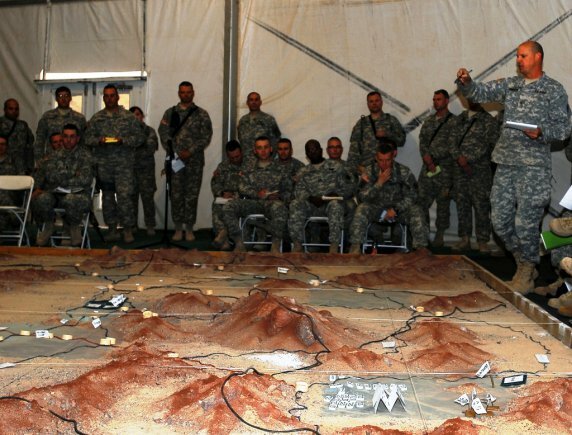 Despite all our military technological advancements, modern war colleges and even troops deployed in the field today still use sand tables for training and planning real-world actions. 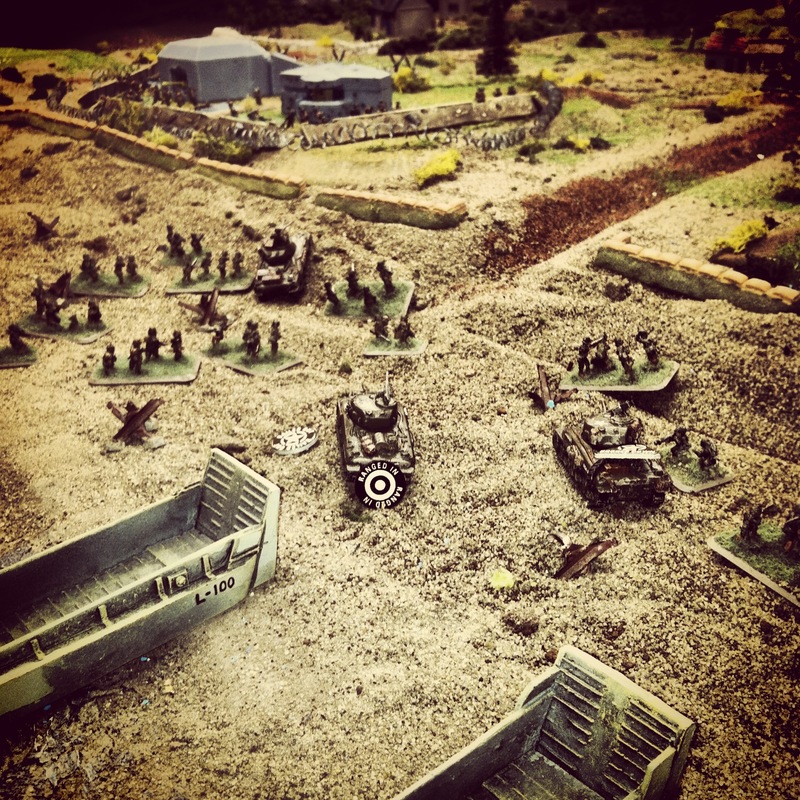 Gaming on a sand table provides a great amount of flexibility and realism in shaping the contours found in real-life battlefields, adding tremendous playability to just about any scenario. 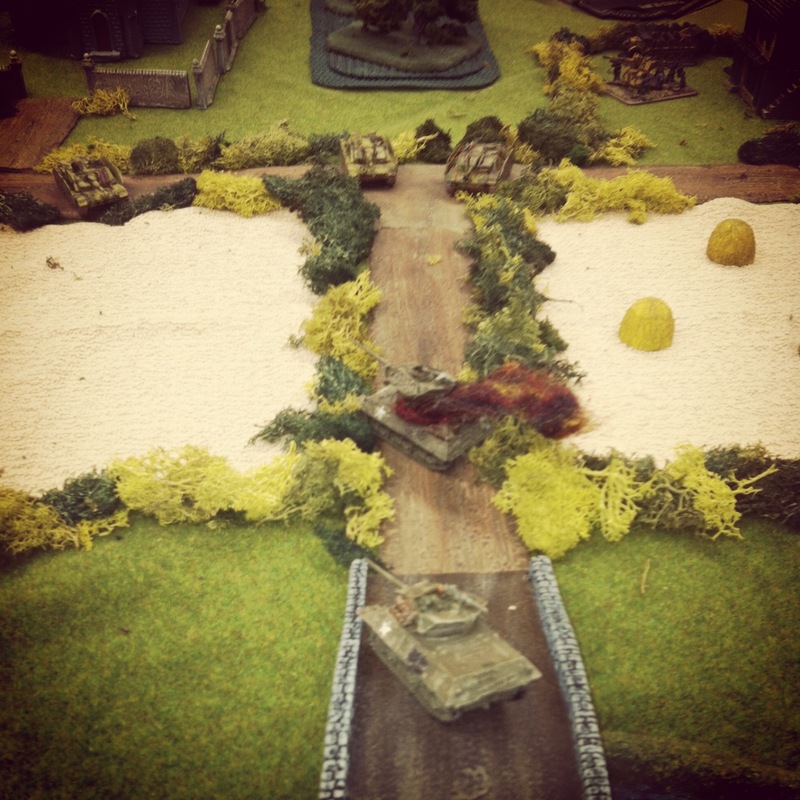 This past weekend a few of us ran an Uncle Red beach assault scenario on one of the club’s sand tables using the Flames of War Amphibious Assault rules and ‘Hit the Beach’ scenario.The 4′ x 5′ table I set up featured a sculpted surf landing zone, sea wall and two beach exits leading to an inland area. Each player placed an objective. 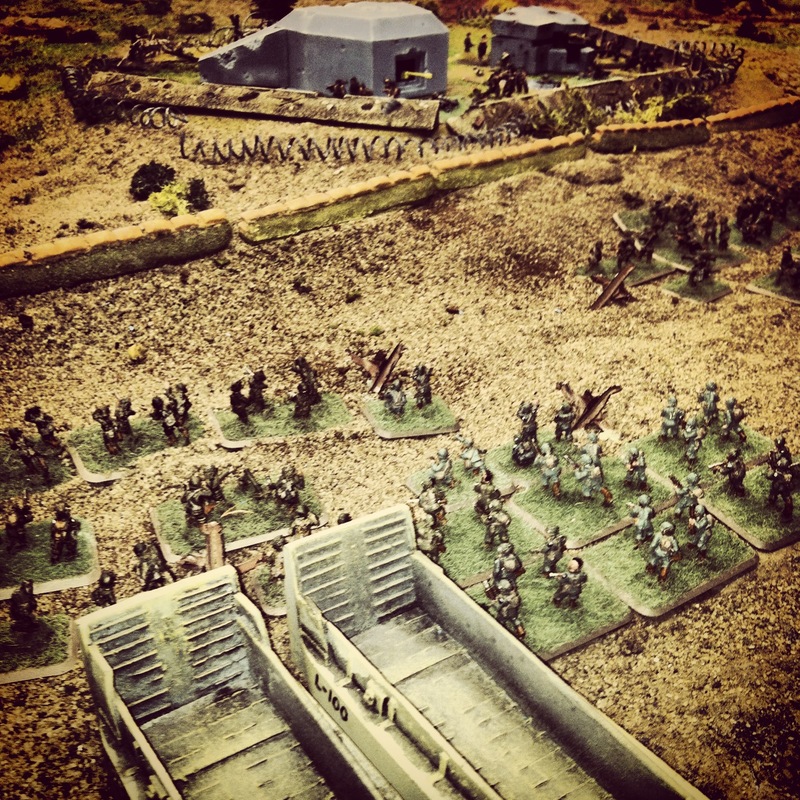 The German player then deployed their coastal defenses at the beach including barbed wire, two bunkers, tobruk machine gun nests and a Grenadier platoon. At the rear of the table, the Germans deployed an artillery battery and another machine gun platoon in a nearby house defending their objective. Half their 1500-point force remained off the table in reserve. 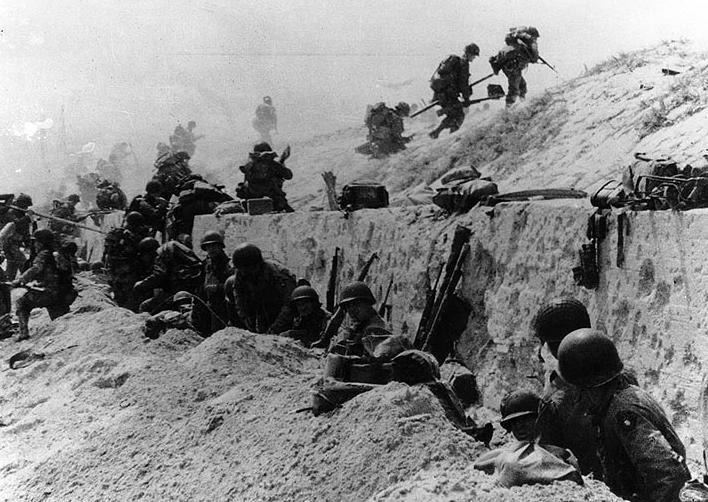 The Americans began with a naval gun barrage pinning every German platoon but only detsroying one stand at the beach. 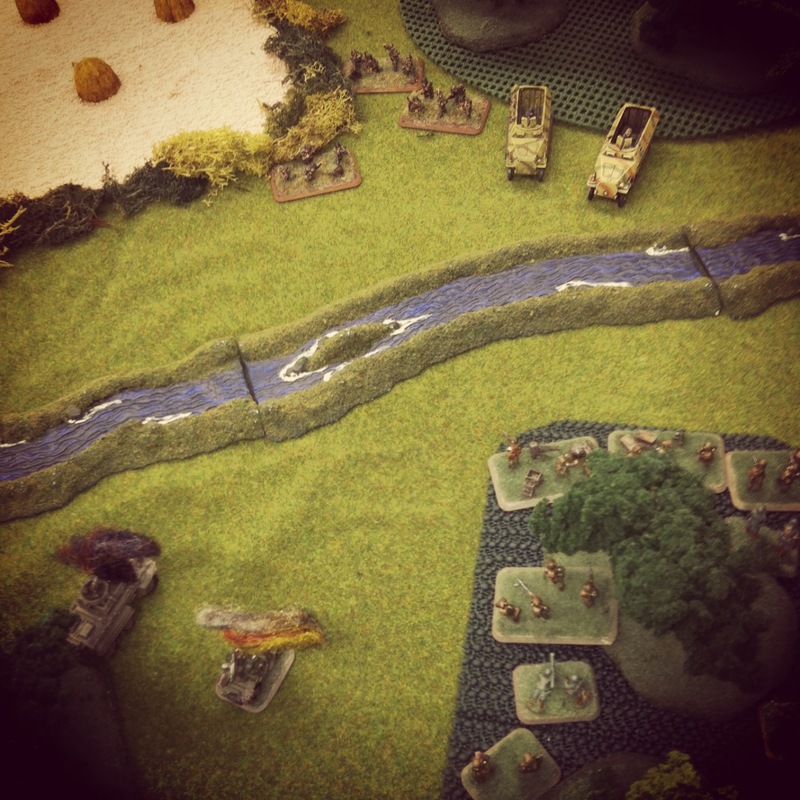 With the first turn, two boat assualt platoons and a pioneer platoon landed at their left and center area of the beach. 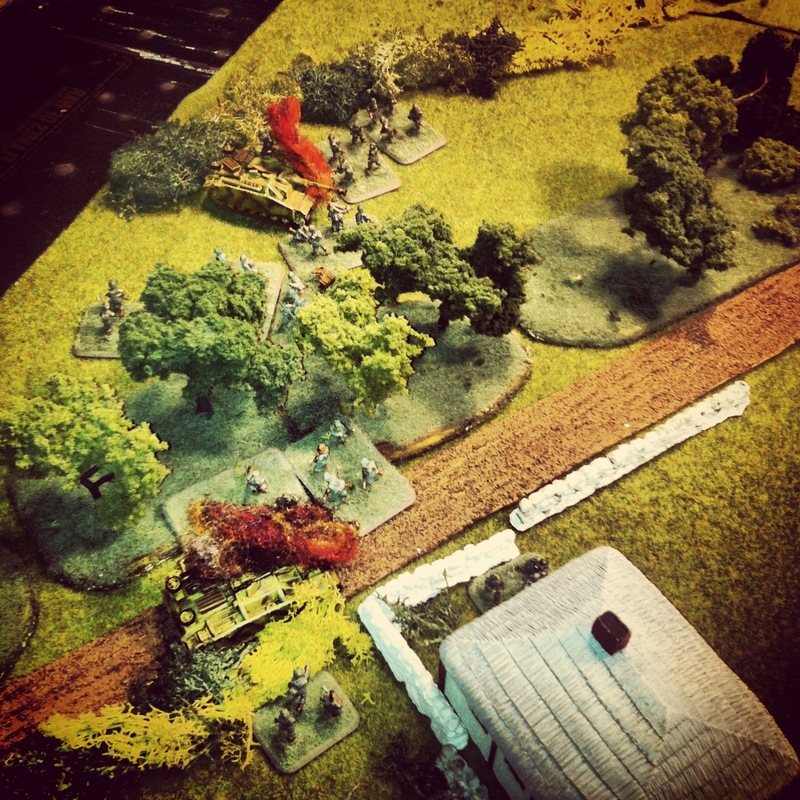 Choosing to shoot rather than move at the double, the first three American platoons were quickly pinned and subsequently destroyed in the first two turns of the game. Choosing to still keep their D-Day tanks off the beach, the Americans attempted another landing in turns three with only two boats able to land. Naval guns and P-47 air support attempting to hit the rear German artillery proved completly ineffective as troops at the beach continued to be pinned and detsroyed. With still more delayed landing reinforcements and no tanks heading for the beach, two US platoons breached the sea wall in turn four. Moving at the double and under heavy machine gun fire, the short-lived progress was stalled and the platoons lay pinned with heavy casualties. Switching tactics in turn five, the Americans went for the right side of the beach. Two boat crews hit the beach moving at the double with three Shermans coming ashore in support. Two tanks immediately bogged, creating two targets stuck on the beach for the next round of incoming German artillery. With turn six, one more Sherman made it to the beach while another was swamped and lay destroyed in the surf offshore. 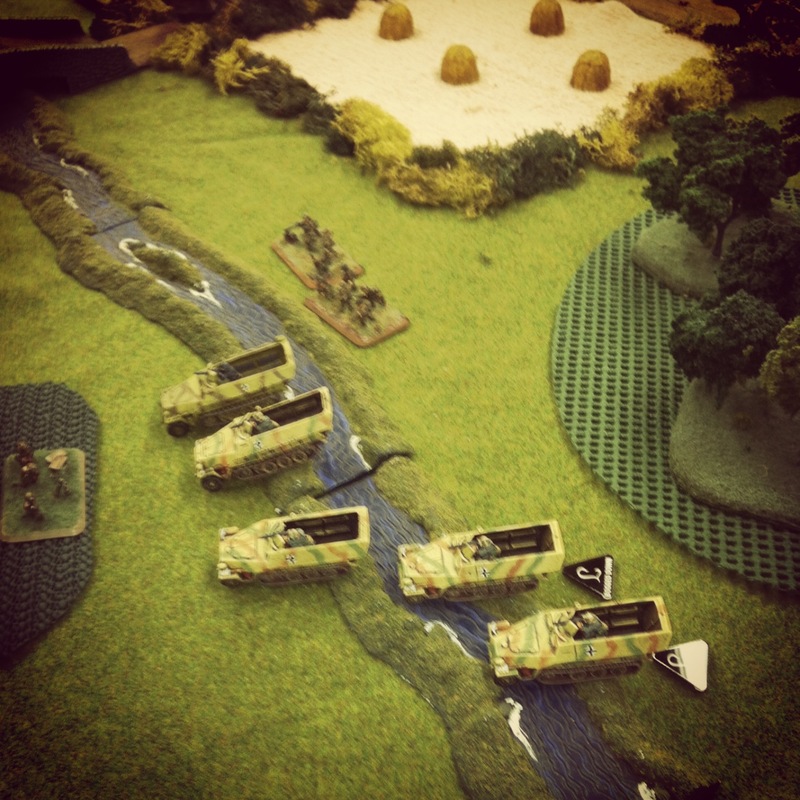 Just one more boat of infantry landed to support a pinned and heavily-damaged platoon already on the beach. 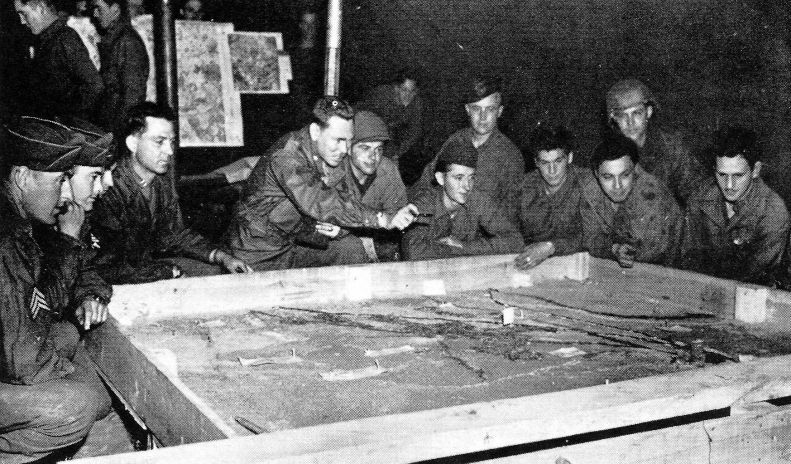 Progress was made over the sea wall with US troops moving out of range of much of the German machine gunners on the far right edge of the table. Finally, the US did some damage with fire from the Shermans destroying several Grenadier units and a tobruk nest. 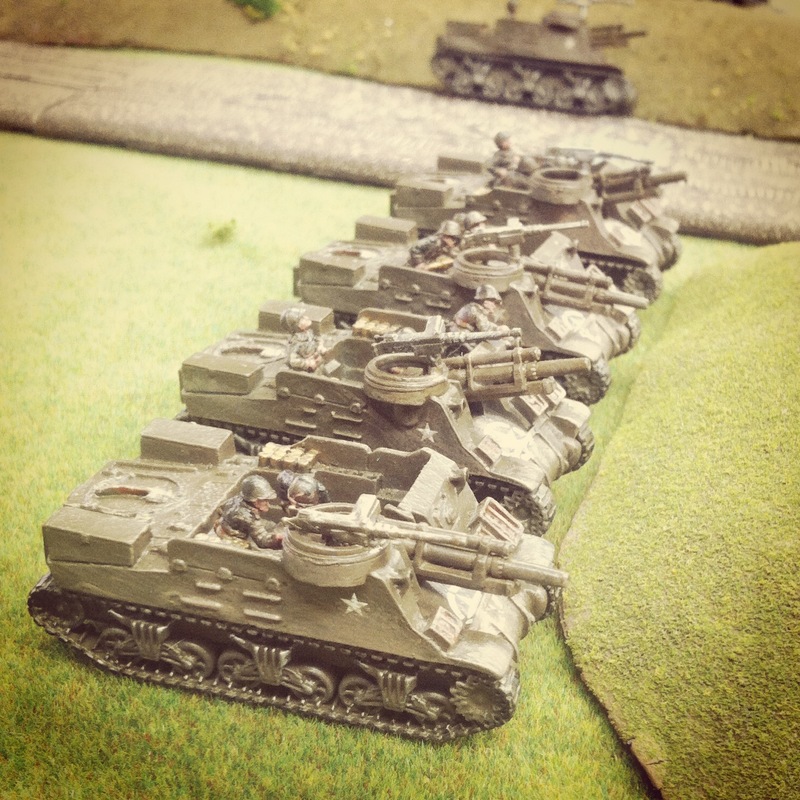 At the bottom of the turn, the Germans brought on their first reserves with a Nebelwerfer battery at the back of the table. One Sherman was hit and destroyed by German artillery and another’s crew bailed out. The US looked to be making a bit of progress as turn seven began with their M7 Priest arillery platoon landing with half of the platoon bogging right off the boat. The remaining three guns, along with three Shermans, took shots at the German defenses and destroyed two more Grenadier stands. 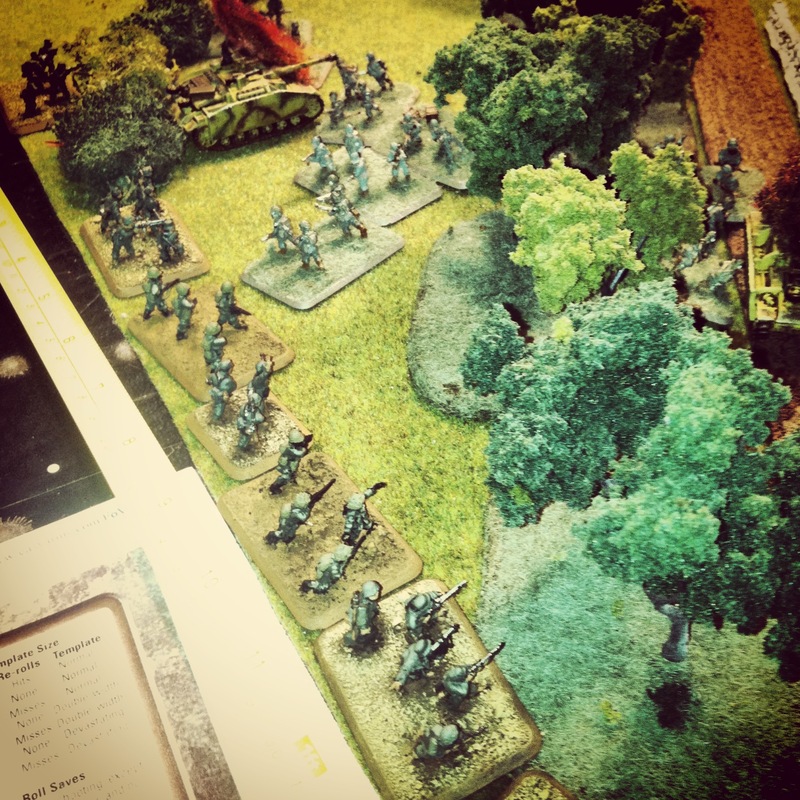 German infantry reserves began rushing on the table in front of the artillery to cover the American objective. On the beach, another monstrous German barrage left the Priests in flames and just one surviving Sherman. At turn eight, the Americans ceded the table after only one additional landing craft of troops made it to the beach to join their final Sherman. This was our first FOW beach landing at the club, and a big learning experience for us. The US players chose to play way too conservatively from the outset with troops moving too slowly off the boat in the first two turns. Leaving the Shermans off the beach until the fifth turn was also a huge mistake, as getting them on sooner would’ve provided greater pinning support and potential for smoke cover for the boat infantry. US air support was frustrating, as often seems the case, and use of the naval guns was likewise botched. The US also suffered from poor luck with too many landing craft either not getting back off the beach to grab more reserves or failing to land existing floating reserves. In many turns, just one of three boats were able to arrive, making it impossible to hit a critical mass of troops on the beach. 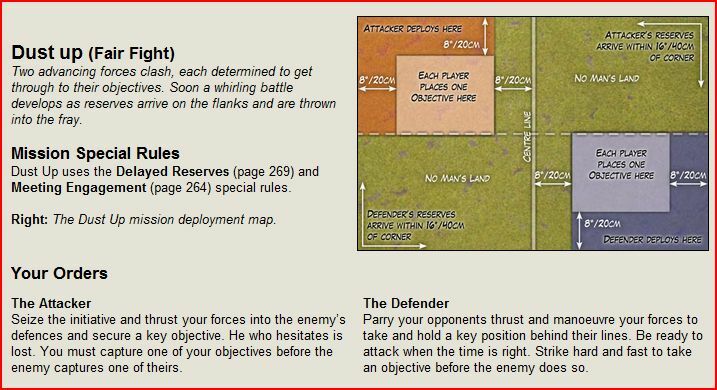 The official FOW website makes all the missions from the third edition rules available online, and they’re a quick way to throw together a game and practice tactics without putting all the work needed into a historic scenario. 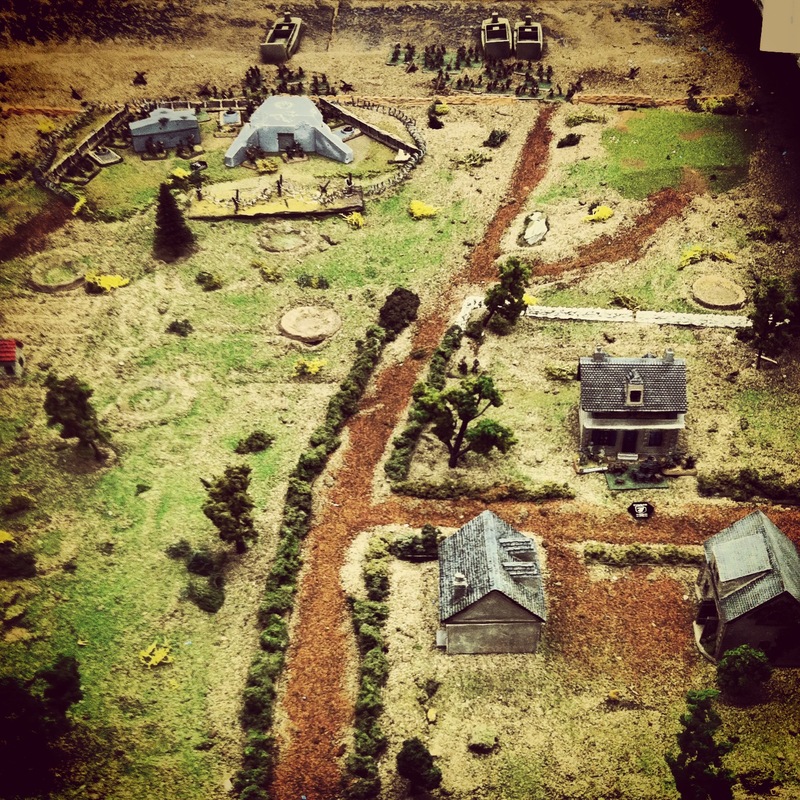 Having been away from a Flames of War table for a week or two, a couple of us at Metropolitan Wargamers in Brooklyn, NY threw together a quick, non-historic Encounter Mission last weekend. 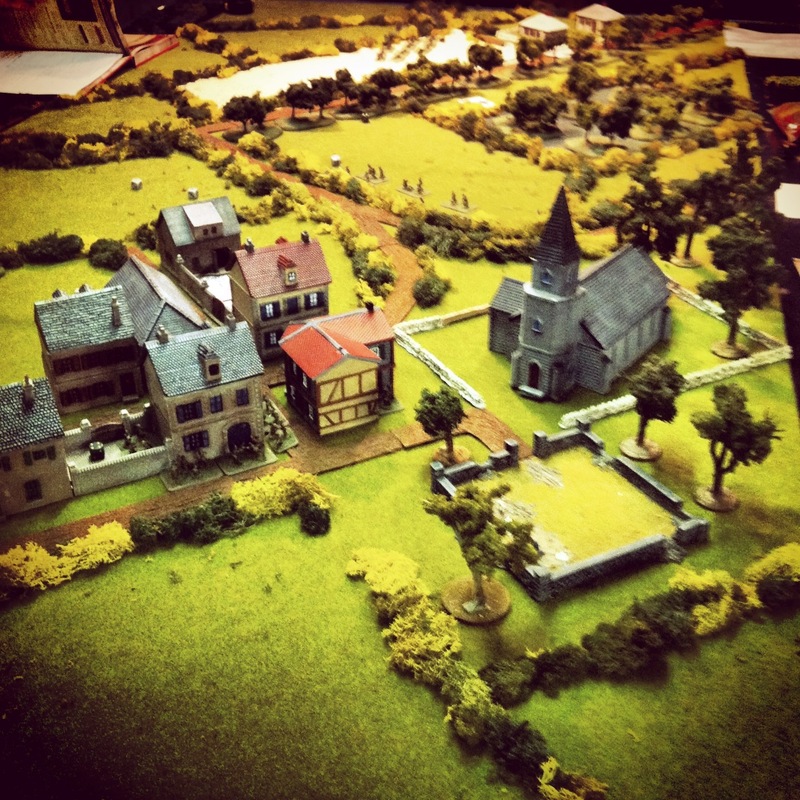 My opponent, playing as Germans, rolled as attacker and chose the long side of the table with the church on his right and a farm and wooded area to his left. This left my US 101st Airborne with the bridged river at my right and a farm at my left as defender. 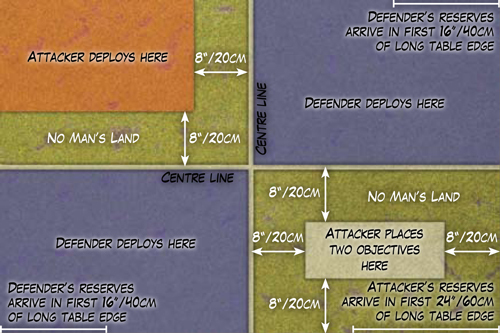 As per scenario rules, we each began by placing an objective on either long edge of the table, placing half our platoons in reserve and deploying the remainder of our starting units along our edges. The Germans won the roll to go first and immediately pressed toward the center around the church yard with their Stug platoon and on their left toward the river with Panzergrenadiers. It was clear the Germans hoped to make speedy run to the objective just on the other side of the stone bridge and ford on the river. In my first turn, I moved my M-18 Hellcat tank destroyers to the bridge and hoped to get some quick kills in on the advancing German Stugs from the bridge. 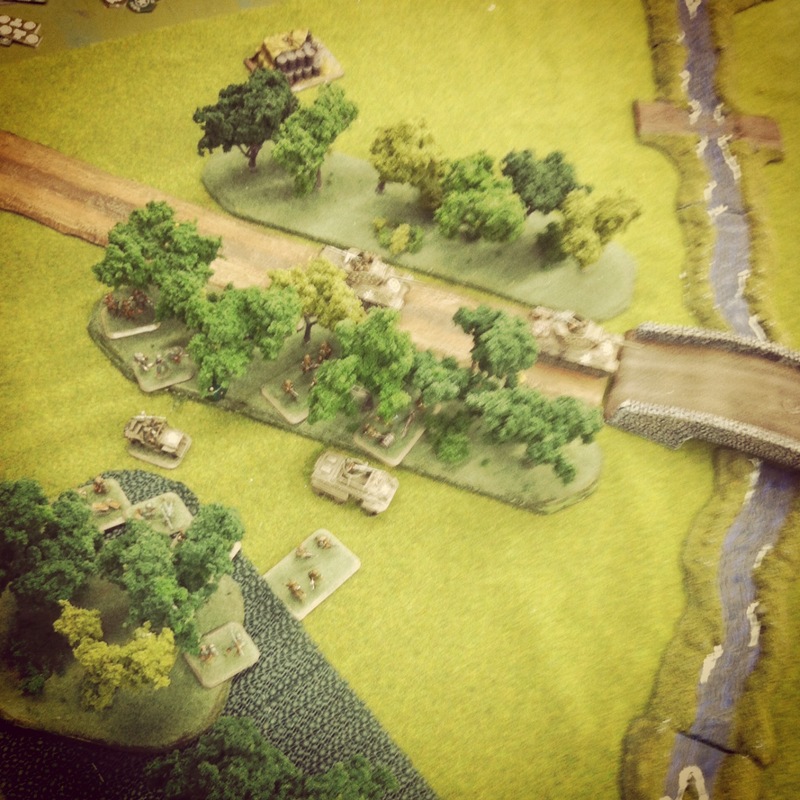 On the other side of the road to the bridge, my US Airborne hustled into the two sets of woods. Hiding among the trees, the paratroopers looked to seal the flank against the advancing German mounted troops on the other side of the river. With my Hellcats missing their shots on the advancing Stugs, the German guns rolled to the intersection just beyond the bridge and destroyed one of my anti-tanks. While the loss of the Hellcat halved my anti-tank capabilities, the burning hulk effectively shut down the German path to the bridge. Across the river, the 101st troops safely fired from the treeline toward the mechanized Germans across the river. With combined fire from a a nearby remaining Hellcat, Jeep and armored car from the tank destroyer platoon, a German halftrack was destroyed and forced its troops to dismount. 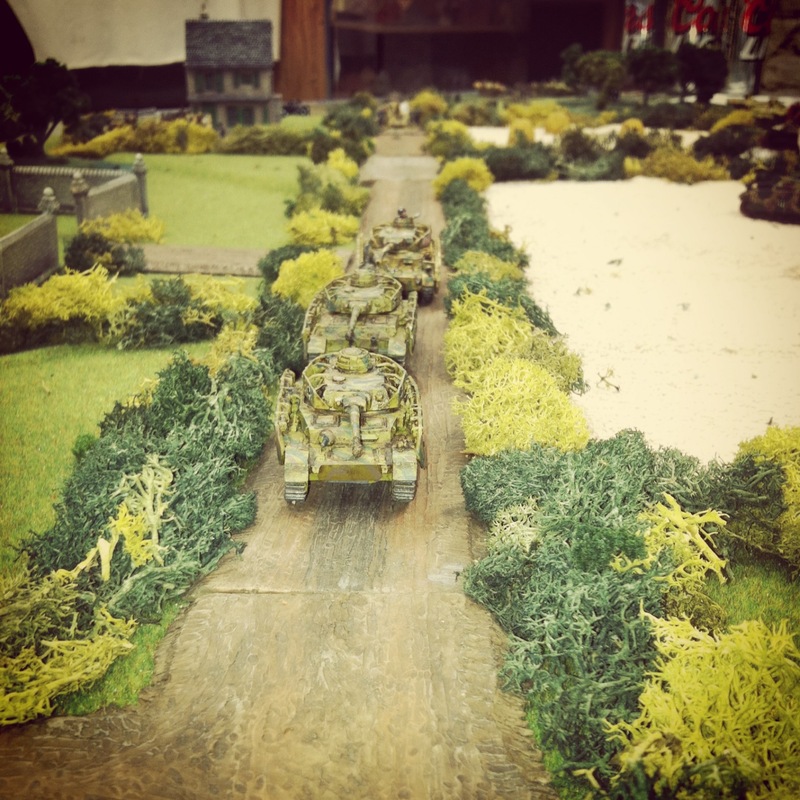 Returning fire, the Germans destroyed the armored car and Jeep. 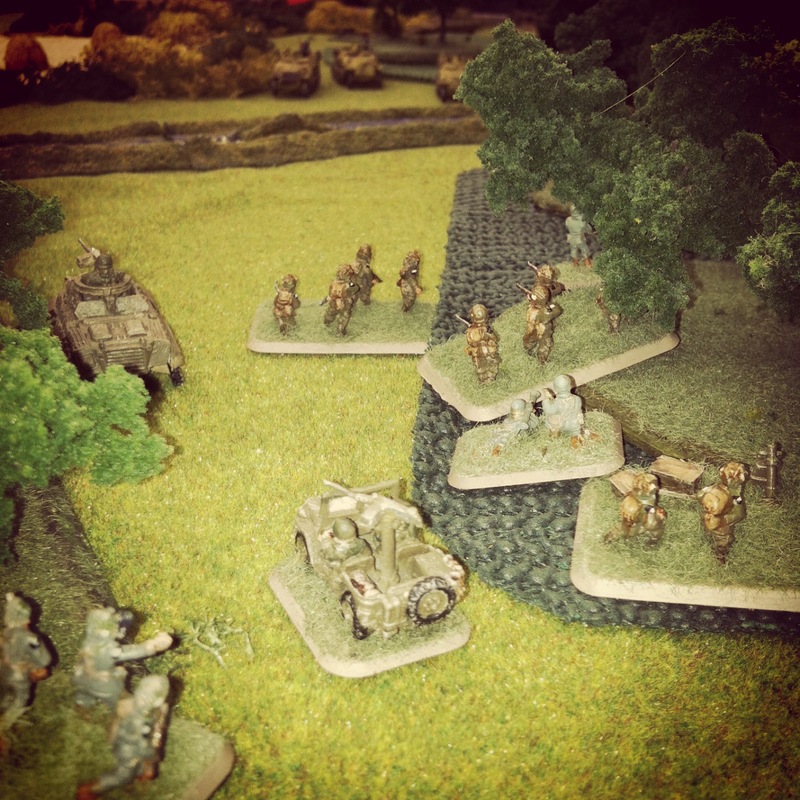 With the road to the bridge shut down, the Stugs turned to speed their way across the fields at the center of the board. 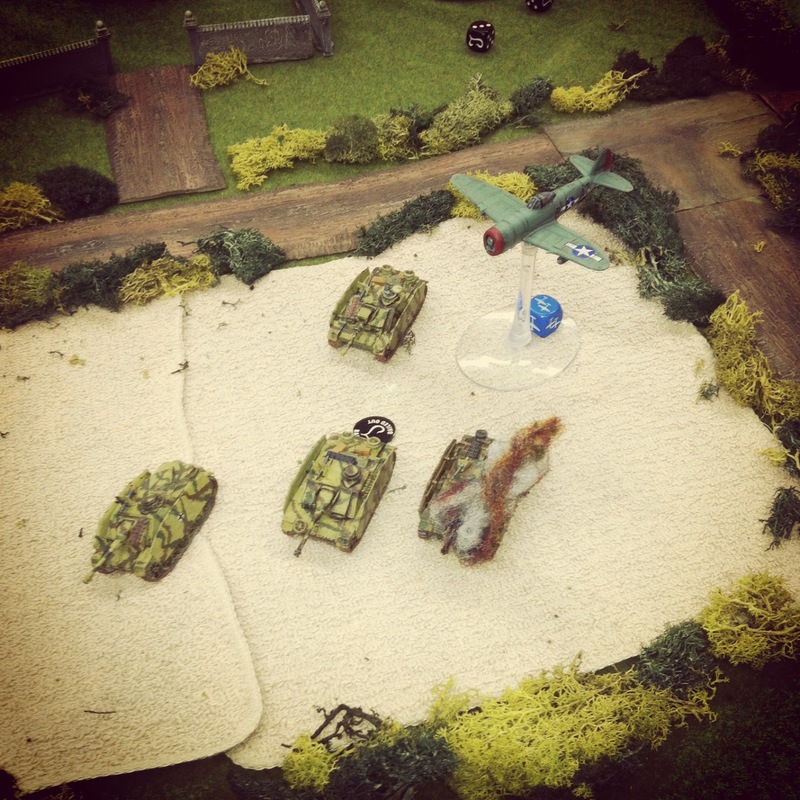 An Airborne platoon took up position on the other edge of the field, lying in wait for the advancing Stugs. The Stugs sitting in the open field made for a quick target for the P-47 Thunderbolt which flew on in turn four, leaving one Stug in flames and a second with its crew bailed out. I their next turn, the Stugs remounted and made their way to the gap at the far edge of the field. A couple quick shots to the side armor of the remaining Hellcat destroyed the remaining US tank destroyer which had been busying itself pouring fore into the still-mounted Panzergrenadiers. 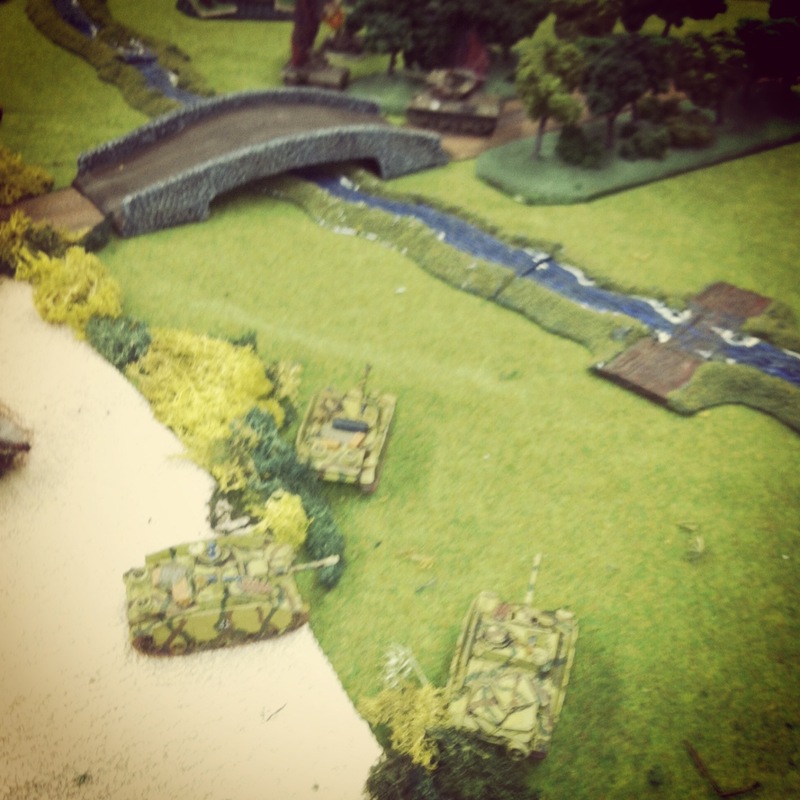 It looked bad for the Americans with nothing standing between the German Stugs and the objective just beyond the river ford. 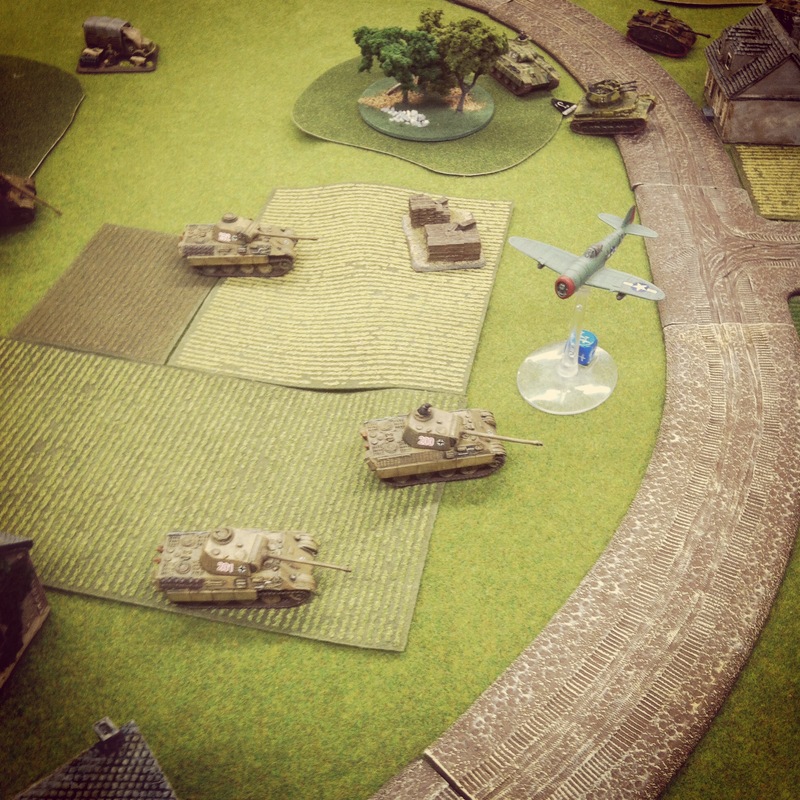 Luck switched back for the Americans as they successfully rolled for their Sherman tank reinforcements in turn five. The Shermans moved to the river’s edge and destroyed the remaining three Stugs. Not only had the German armored advance to the objective been thwarted, but yet another easy path had been closed-up with a burning Stug clogging the exit from the field. By turn six, the German Panzer IV reinforcements were rolling down the road looking to run around the far edge of the field and attack the US left flank. The left side was only held by a US light machine gun and rifle platoons, so armored support was badly needed if the Germans were to be stopped. At the intersection on the US left, ferocious fighting erupted as an assault from the usually stalwart 101st Airborne was repelled. 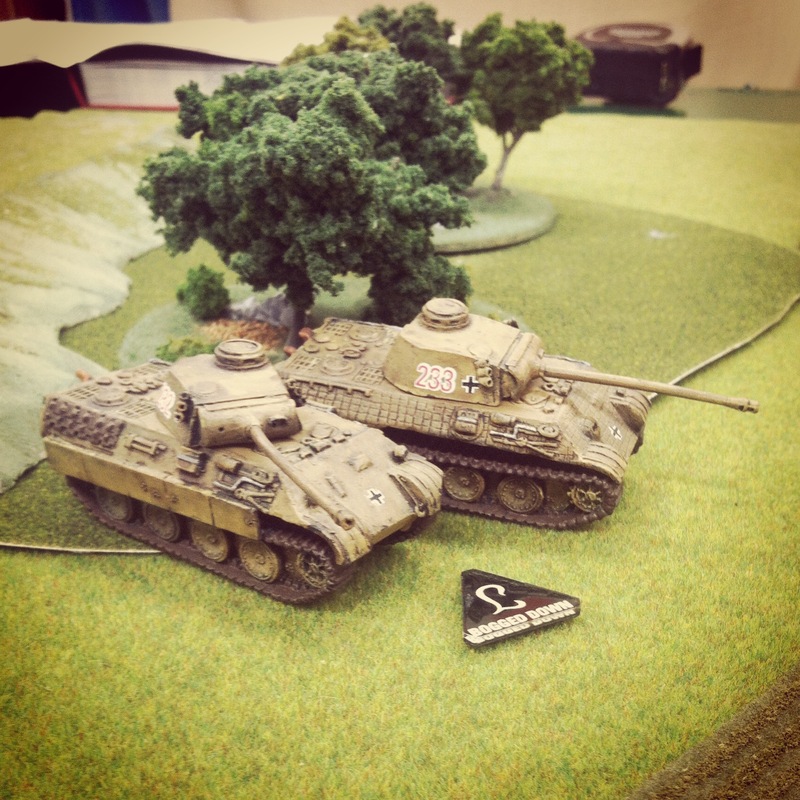 The Shermans moved in and destroyed a Panzer IV. With space and options getting tight, the Panzer IV’s returned fire and Sherman was left burning. With a two-on-two fight. 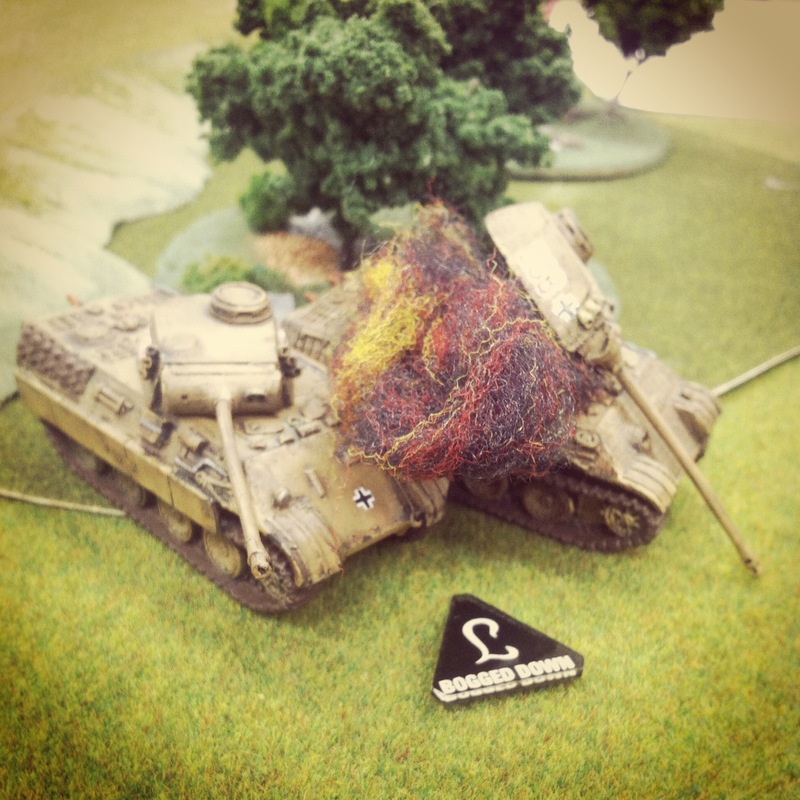 the Shermans destroyed another Panzer IV in the sixth turn and the final German tank fled the field after failing a morale test for the pummeled platoon. 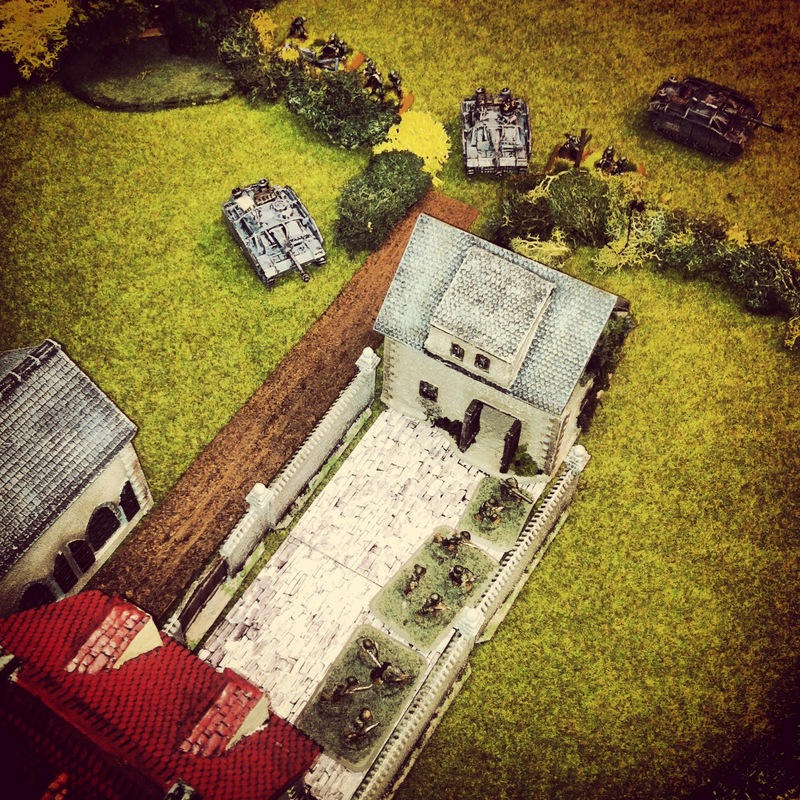 With German armor destroyed across the field, the US rifle and light machine gun platoons scurried to the German right toward their objective behind the church. 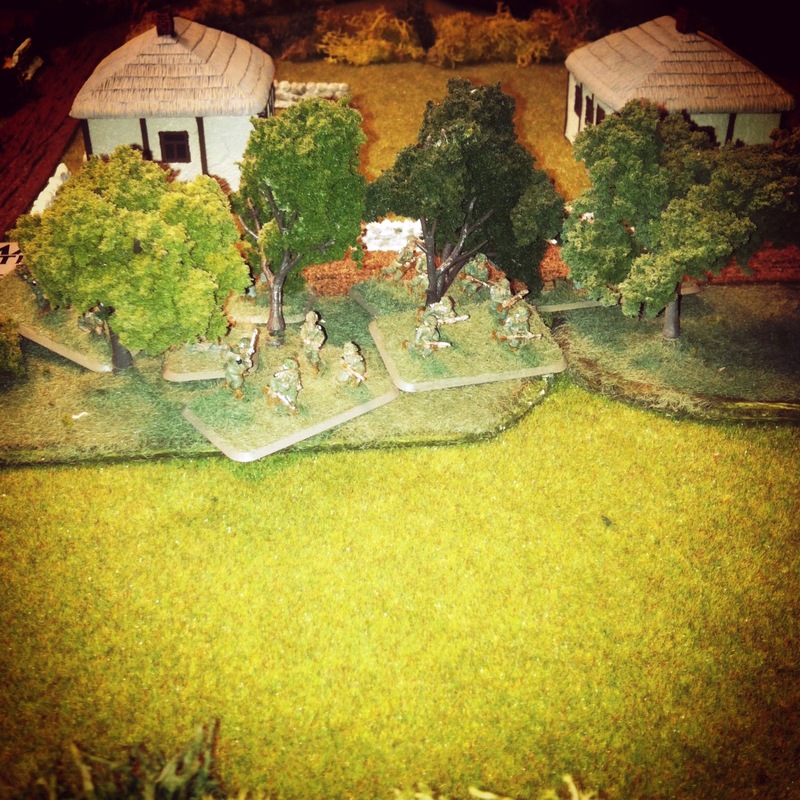 The final turns of the game played out back at the river with the reinforced Germans struggling across the river. Fire continued to be exchanged with the US rifle platoon in the forest which eventually fell back into the treeline at the road. Another run from the Thunderbolt threw more Germans from destroyed transports. Remaining Germans trucked over the river and around the woods with only only a few US rifles between them an victory with capture of the objective. 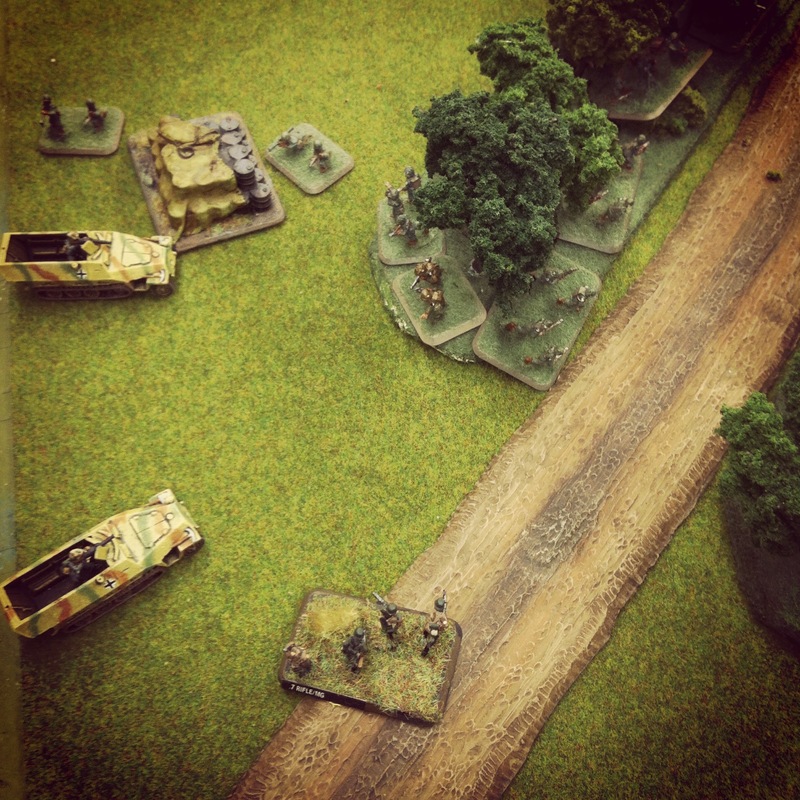 On the eight turn, it all came down to the contested objective. With a full US parachute rifle platoon in the woods and another heavily-damaged one nearby, the final battle looked like it was going to be decided with some bloody assaults. 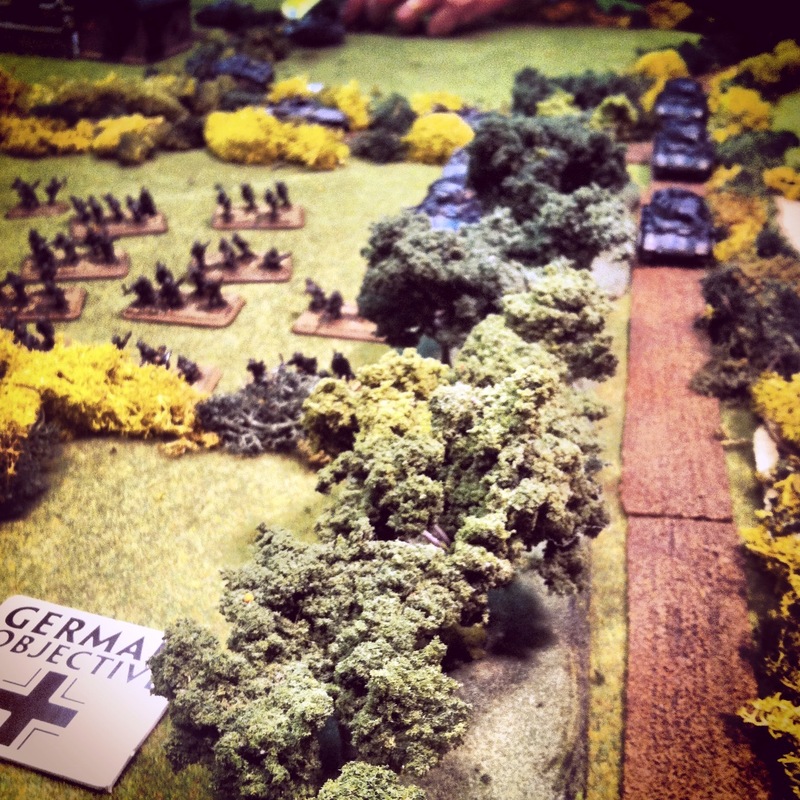 It looked like anyone’s game, but the Germans were now at half-strength on the table, and a failed motivation test caused the Germans to cede the battle. 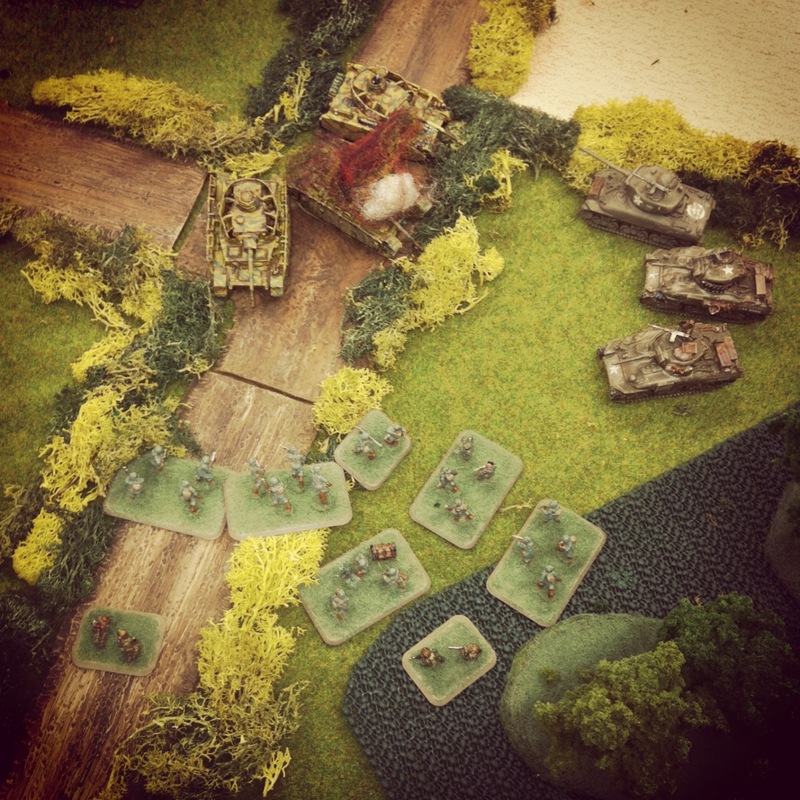 German artillery never played a factor in the game, and the heavy terrain shut down use of US air support except for in two deadly runs of the game. Tanks on both sides wound up serving more as roadblocks at some key points on the road, and the river also played an important role in the US defense against the German advance. We’ve got a couple historic scenarios at the club I’ll be reporting on soon, including a landing at Utah Beach and a scenario from the first day of the Battle of the Bulge. What makes FOW flexible and so enjoyable as a system is the ability to play historic and non-historic engagements, something I experienced last week and am certain to see more of in my after-action reports soon to come. Shortly after fighting ashore and in the iair drop zones on D-Day, the Allies quickly discovered a new enemy awaiting them: bocage. Lacing the Normandy countryside, bocage was a tight overgrown network of hedgerows of shrubbery, stone walls and copses of trees lining the rural French fields. 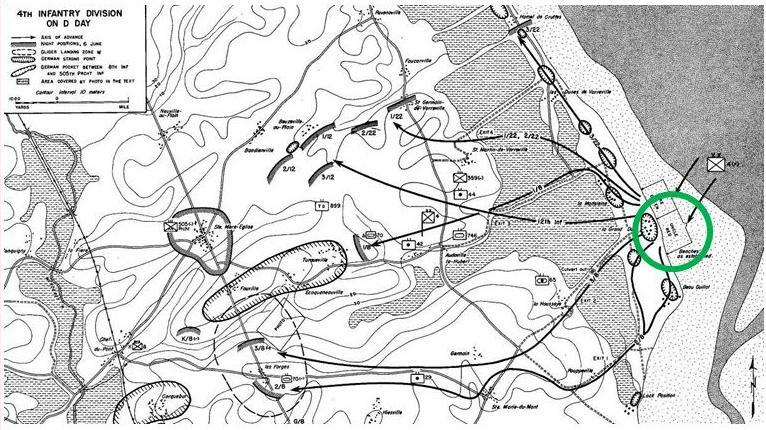 All but impassable by Allied armor and difficult to fight through for infantry, bocage slowed the push inland and delayed the taking of key objectives. It was only through the quick-thinking and inventiveness of the Allies that new tactics were hastily developed. To free-up the passage of tanks, hedgerow cutters were welded to the front of armored platoons and demolition crews blasted gaps to continue the forward march. Fighting amidst the bocage would prove to be deadly for both sides, as recounted in the 1988 paper by Captain Michael Doubler. It’s required reading for anyone interested in the tactics of bocage warfare. 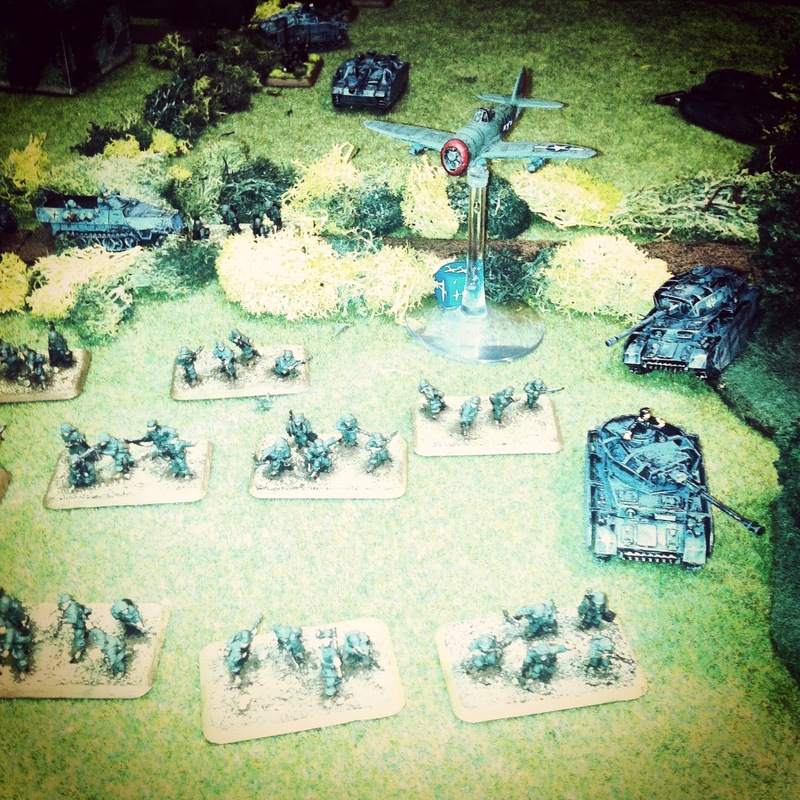 This past weekend at Metropolitan Wargamers in Brooklyn, four of us got together to slog it out in the bocage tabletop of a Breakthrough Mission as provided in the Flames of Wars rules. 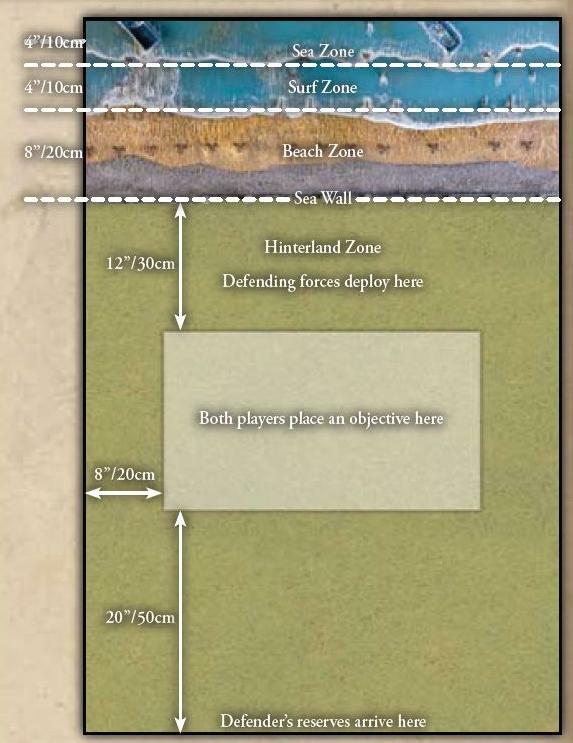 The mission scenario calls for use of the Mobile Reserves rule for the defenders and the Delayed Reserves rule for the attackers. The Germans chose to field a 1250-point Fallschirmjager company backed with heavy machine guns, a Nebelwerfer rocket battery, Stugs and Pak 40 anti-tank guns plus a 1250-point tank company armed with mechanized infantry, Panzer IVs, Stugs and one imposing Tiger tank. 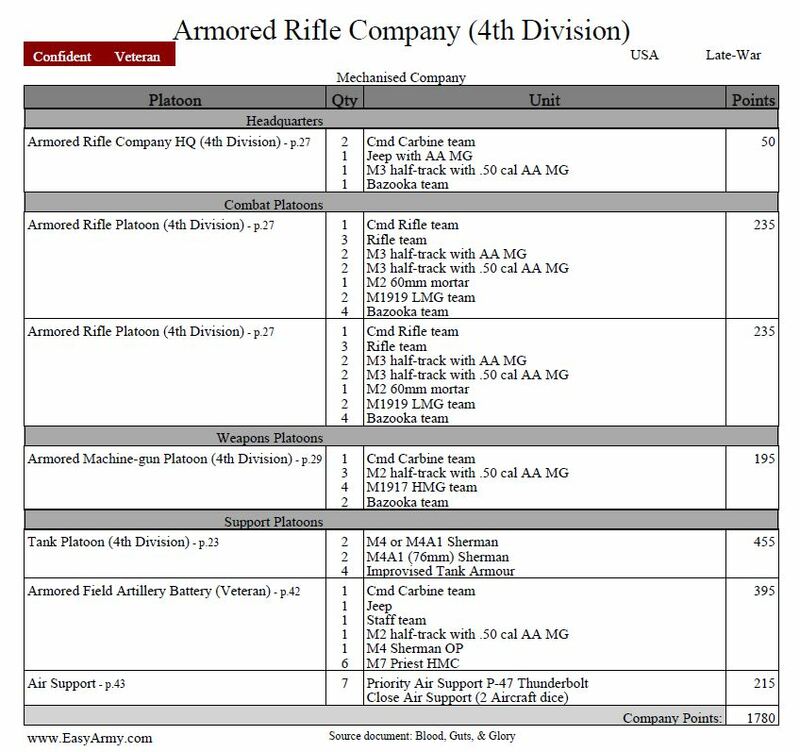 We Americans also fielded two companies beginning with a 1250-point rifle company with three infantry platoons, Shermans, a weapons platoon of light machine guns and mortars and a P-47 Thunderbolt for air support. 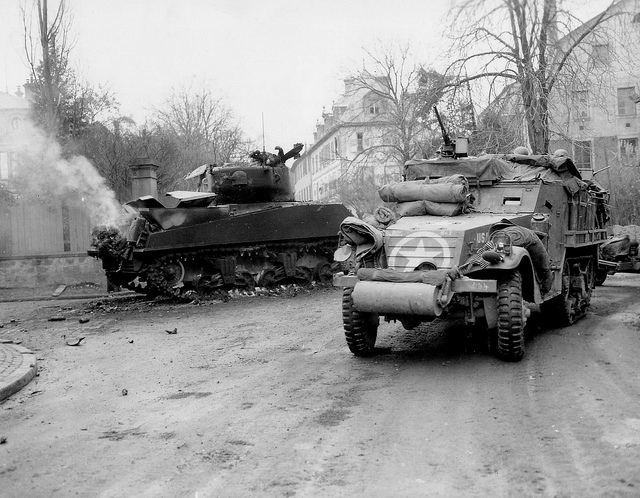 The other US company was pulled from the 82nd Airborne with a Priest mobile artillery battery and Stuart light tanks. To aid in navigation of bocage, the US armor were outfitted with hedgerow cutters. 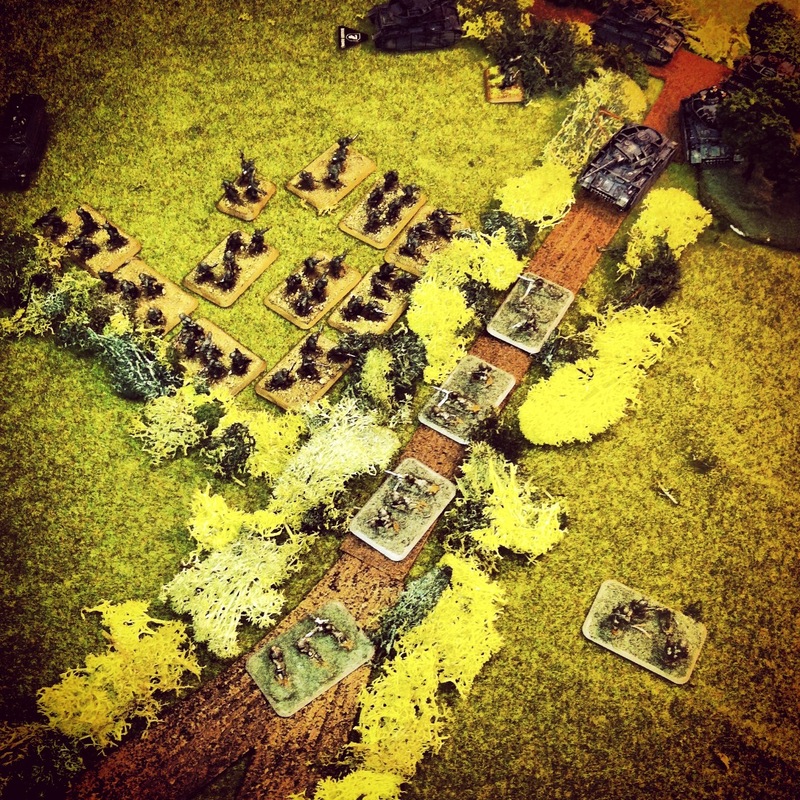 The Germans had six turns to take an objective and it would be the Americans’ job to stop them. 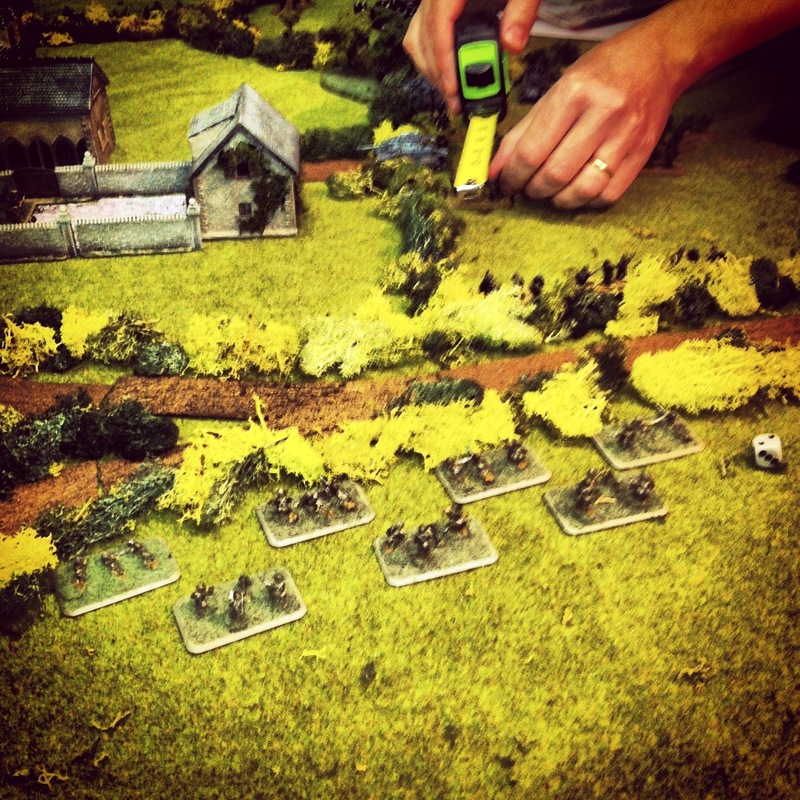 The table was laid out thick with bocage surrounding a small village and a nearby farm. Americans rolled as the defenders meaning all our mobile units — all the tanks and artillery we had — were going to be held off the board as reserves. I hid all my rifle platoons in the town’s buildings and stuck the machine guns and mortars in the field between the Germans and their nearest objective. 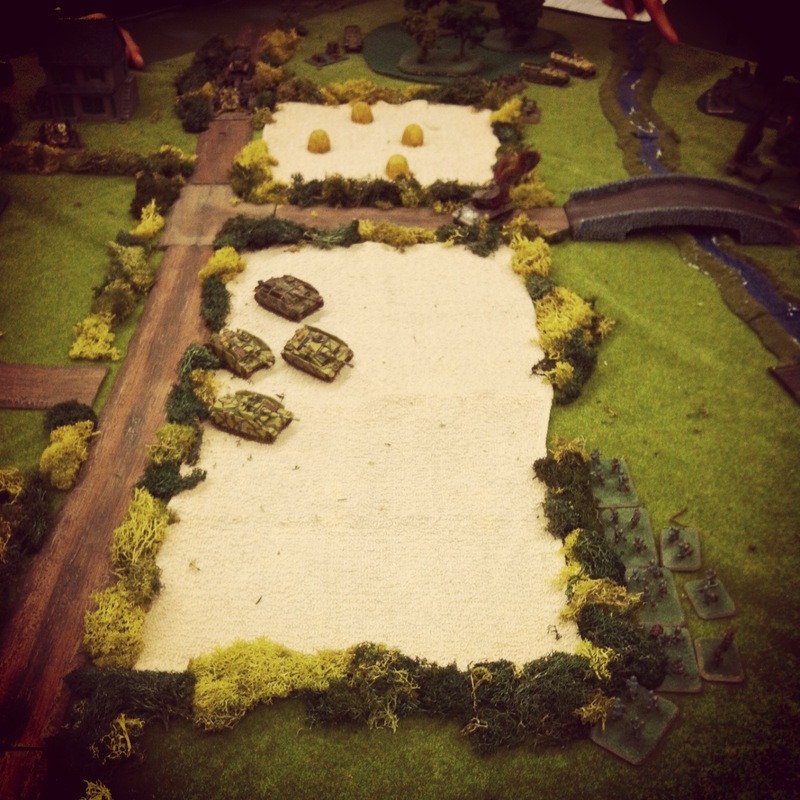 In the opposite corner, the Airborne platoons deployed near the farm hoping to camp out on the German objectives for the duration of the game. 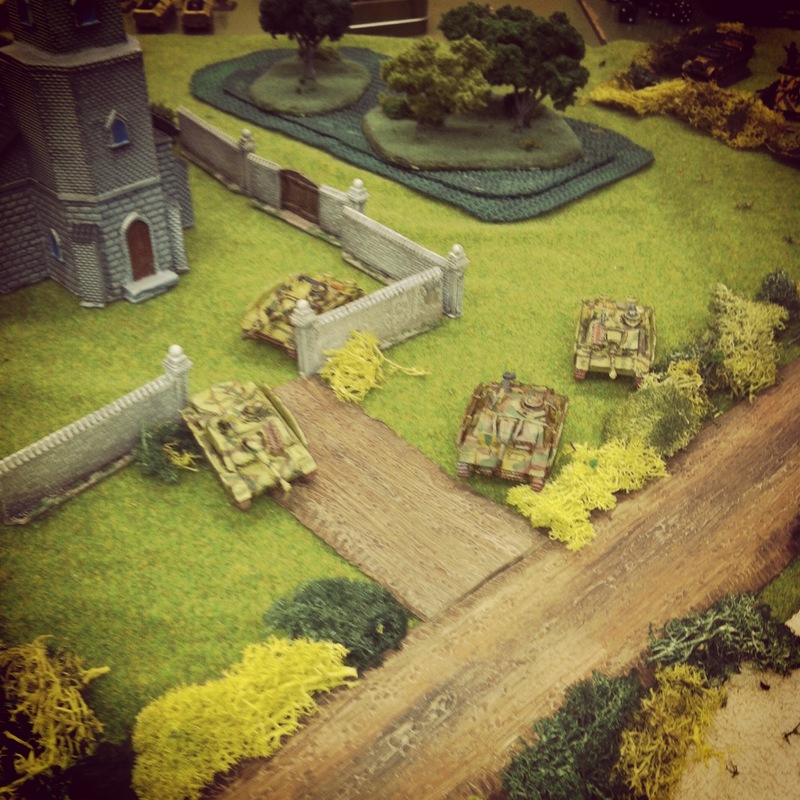 As the attackers, the Germans deployed in their assigned corner of the table. Their rocket battery, anti-tank guns, heavy machine guns and the majority of their infantry dug into the field outside of the town. The large tank company deployed in the adjacent field. Held off-table was a Stug and a Fallschirmjager platoon, hoping for the a delayed reserves roll beginning on the third turn to put them right on top of one of their objectives at the opposite corner. 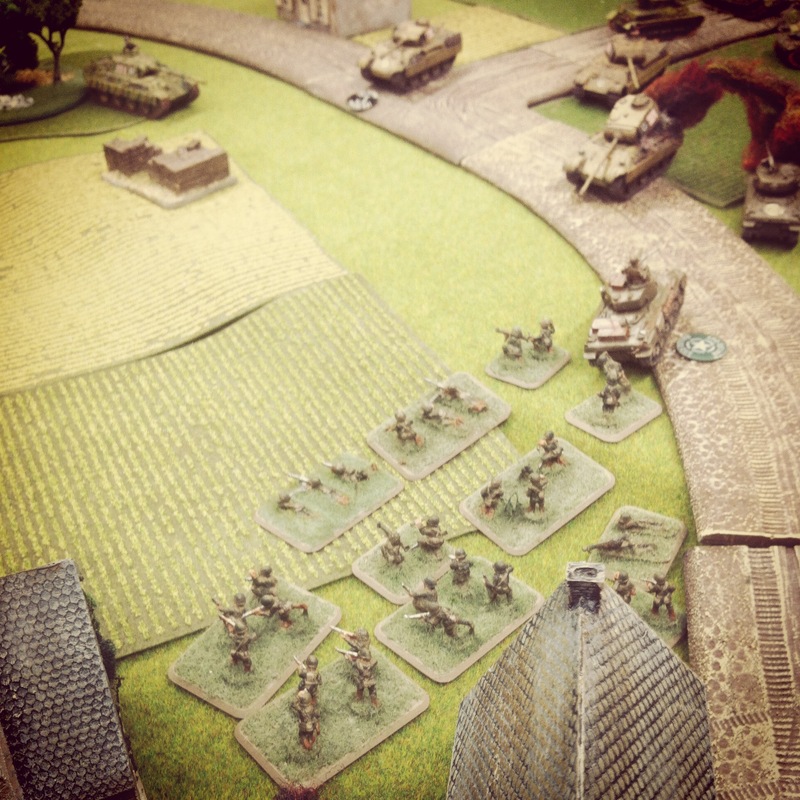 As the attackers, the Germans got the first turn, quickly pressing their armor toward the center of the table while the rocket battery, heavy machine guns and anti-tank cannons poured fire into the town, pinning one US platoon. Reserves failed to arrive on the first US turn and the P-47’s first run came up empty. 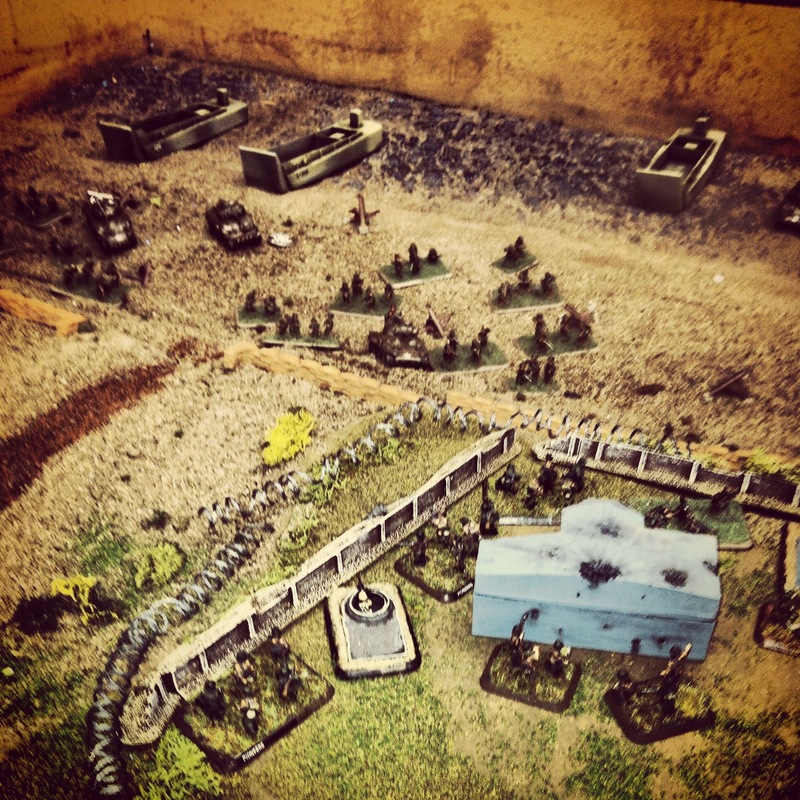 As per the plan, the US Airborne pushed into the farm buildings to hold the nearest objective. 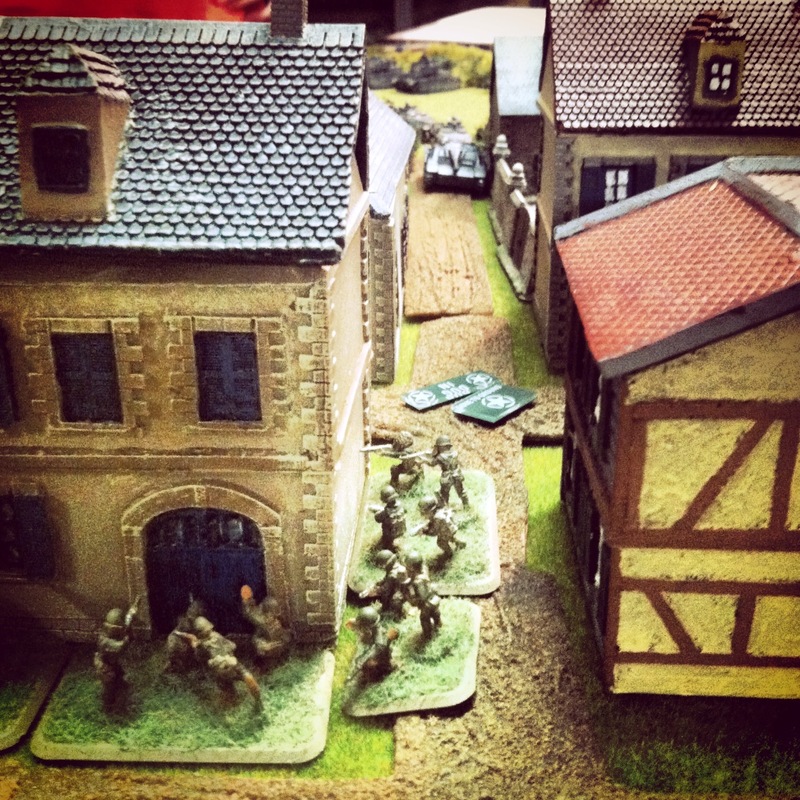 In the second turn, the Germans continued to light up the town with the US companies pinned in the buildings. 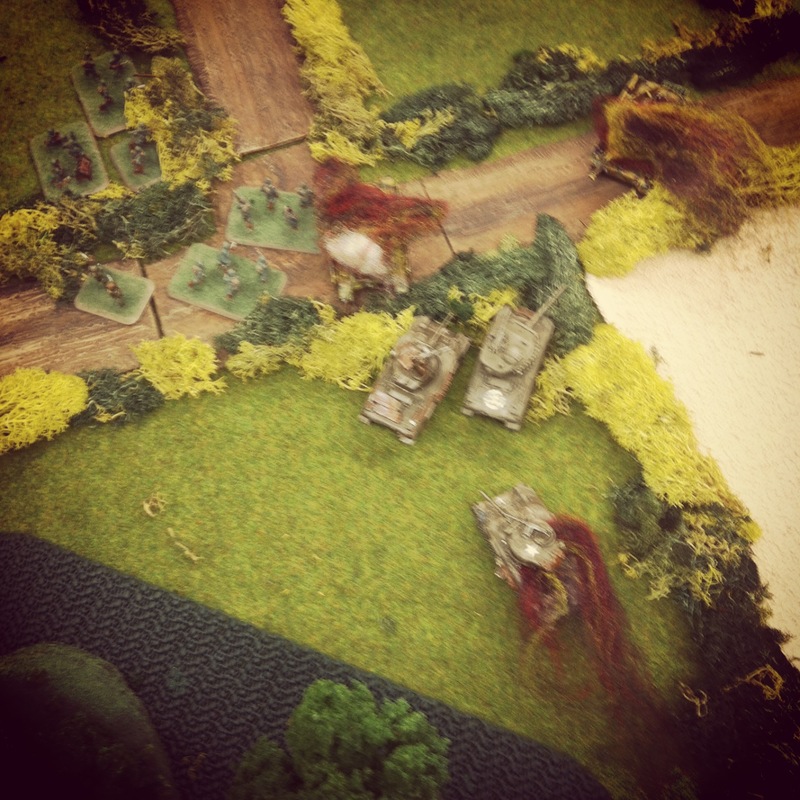 A Stug opened fire down a lane but the Americans avoided being hit. US bazooka teams moved into the barn at the edge of town and took shots on the a German Stug and approaching half tracks but to no effect. 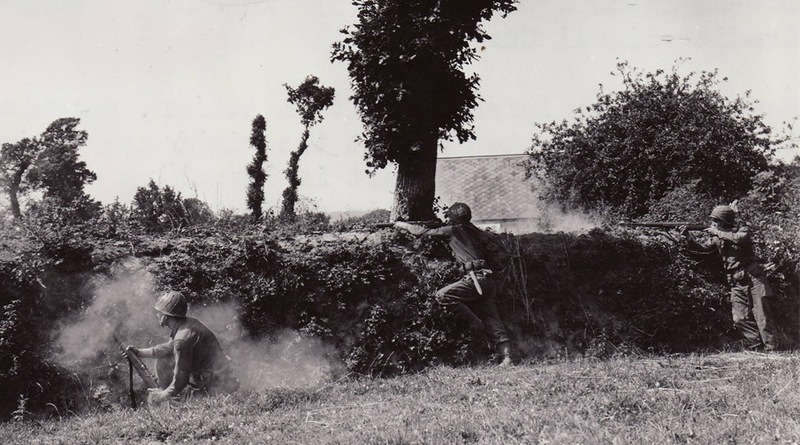 The US machine gunners attempted to fire and then assault the nearing Germans but were thwarted by the thick bocage and failed terror test against a nearby Panzer. The Thunderbolt once again on did nothing its second run while the Airborne units at the farm ran across the road into the treeline, securing the second German objective. 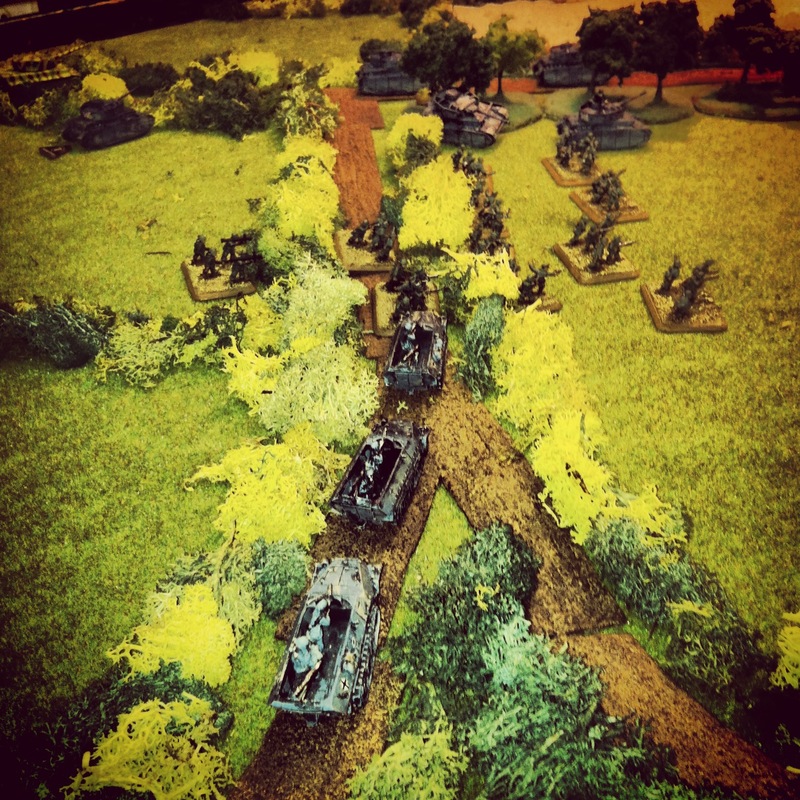 In turn three, the German players thankfully failed their first attempt at calling in reserves. Pressing on, German half tracks raced through the town toward the American weapons platoon which took heavy casualties and lost the machine gunners to fire from both sides. Stugs and artillery continued to pound the American rifle platoons in the town. 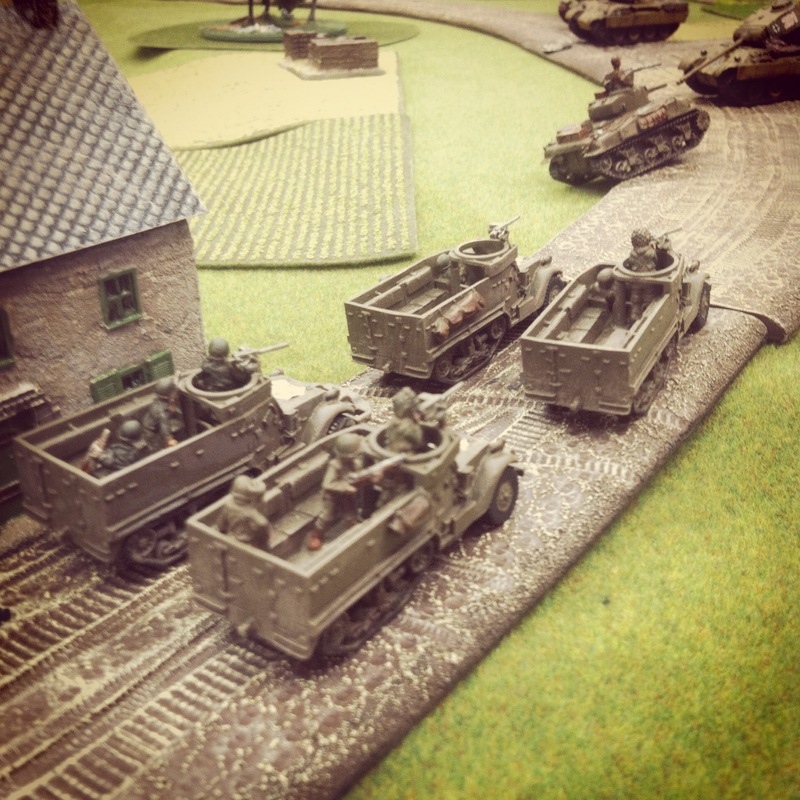 At the top of their turn, the Shermans arrived and made a hasty path to cut a hole in the bocage standing between the rest of their reserves and the nearby road. 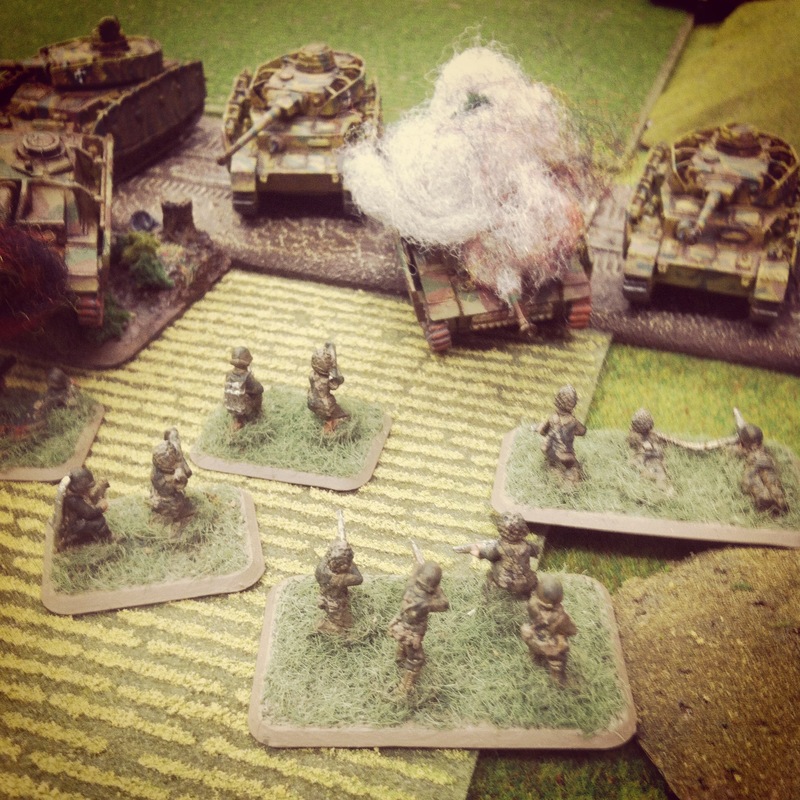 Things really heated up in turn four as the Germans rolled on their first reserved Stug platoon near one of the objectives and the awaiting US Airborne. German infantry and Panzers pushed into the next field, knocking out the US mortars and eliminating their first platoon. 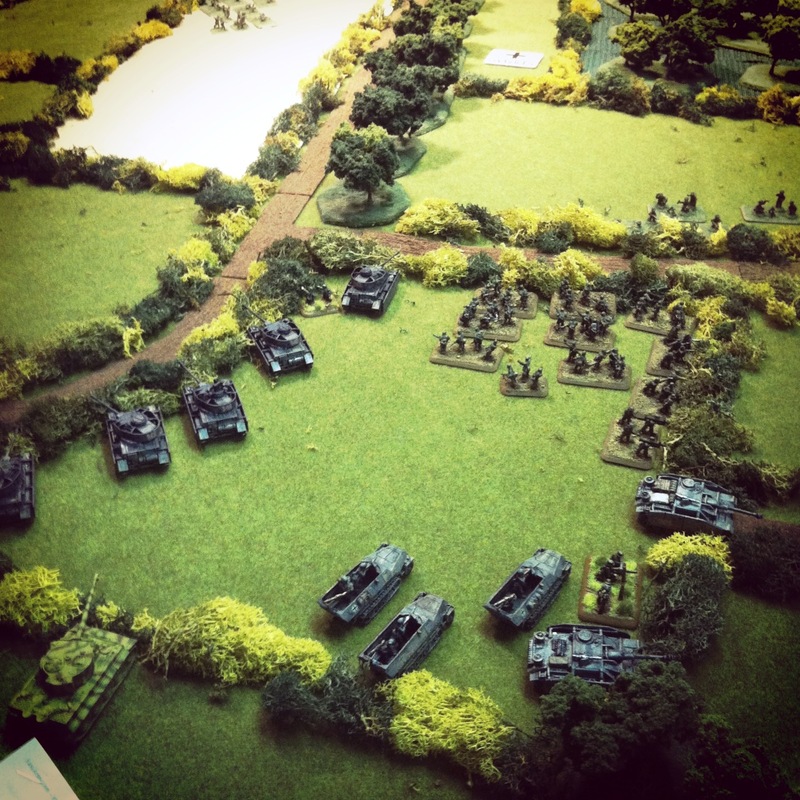 The Americans pulled in the rest of their reserves but immediately created a bottleneck of Shermans and Stuarts as paths were cleared through the bocage. 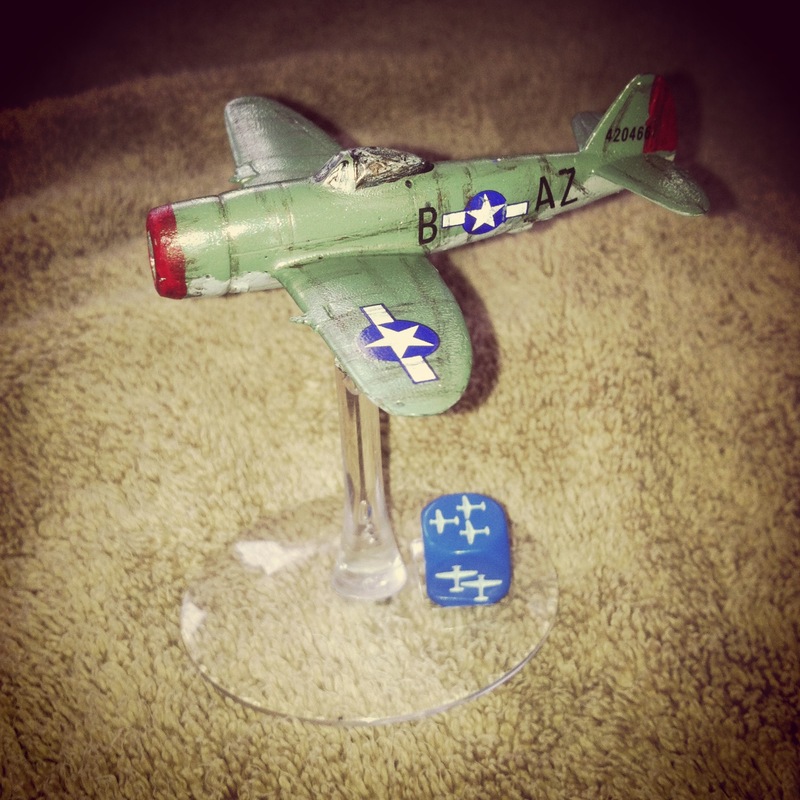 The P-47 came in hard on the Germans in the field, knocking out several units and destroying a Panzer. Finally, the fearless Airborne did what they’re trained to do and burst from the treeline to assault the newly-arrived Stug platoon. 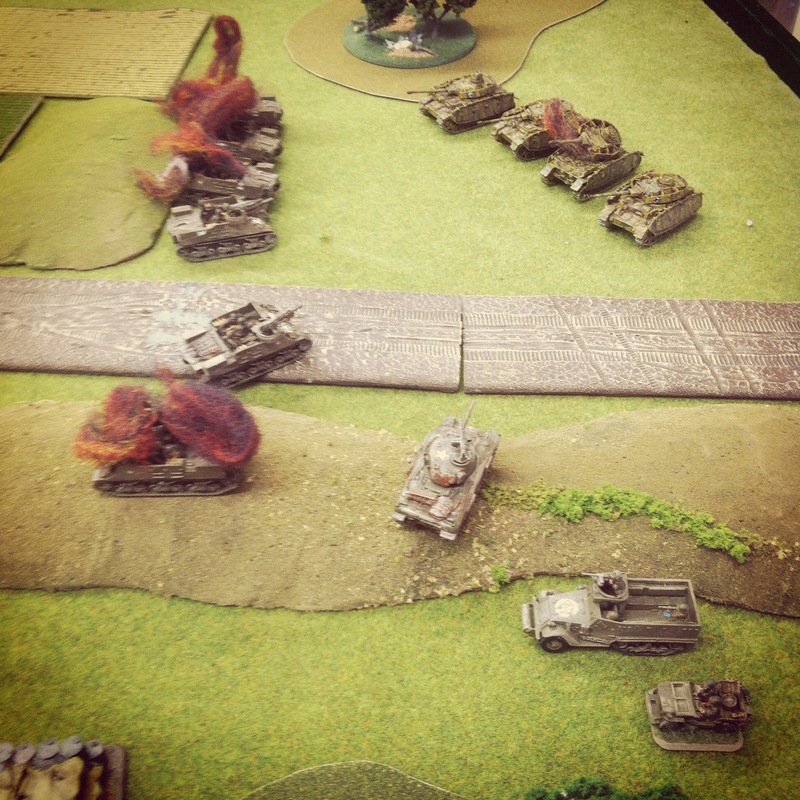 Two Stugs were destroyed and the third fled the field after a failed morale test. 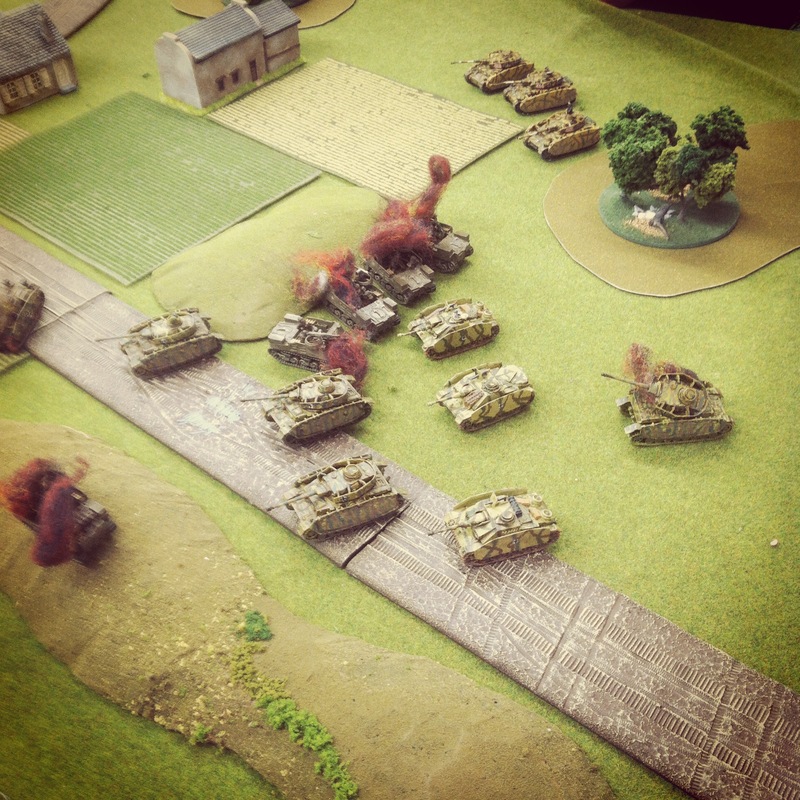 The objective was still held by the Americans but things were looking dicey with Germans coming in from all sides. The fifth turn started with the final German reserve platoon arriving amid their burning tanks and assaulting the US Airborne. Through a series of attacks and counterattacks, the two groups whittled each other down. The Germans were eventually ground down to two remaining stands, lost their morale check and were destroyed. 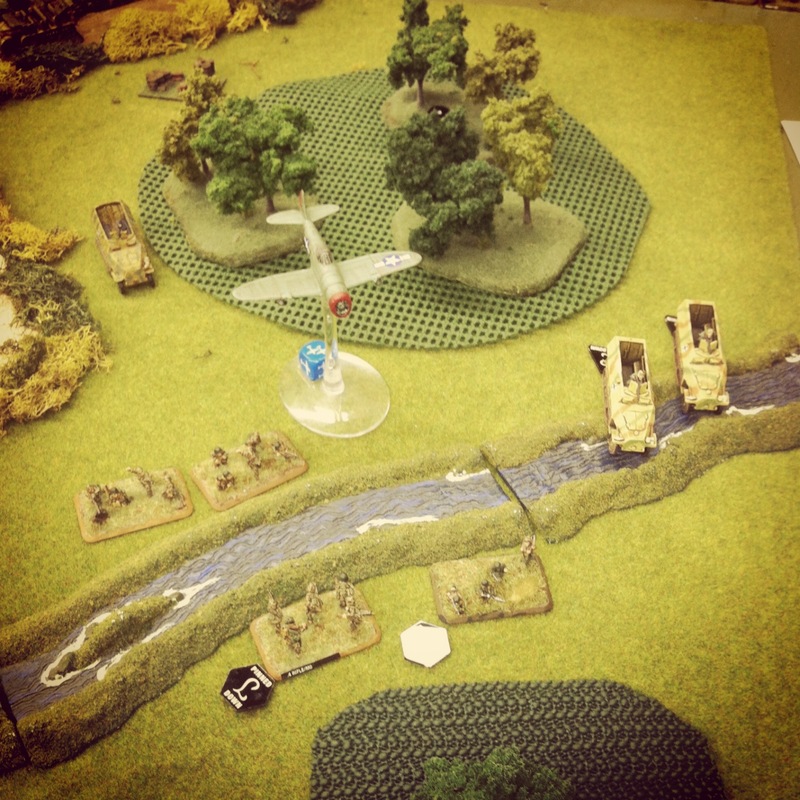 The victory for the Americans was short-lived, however, and the heavily-damaged Airborne platoon also failed a morale save and likewise fled the battle. With the game nearing it’s end, a Sherman was destroyed and blocked the road. 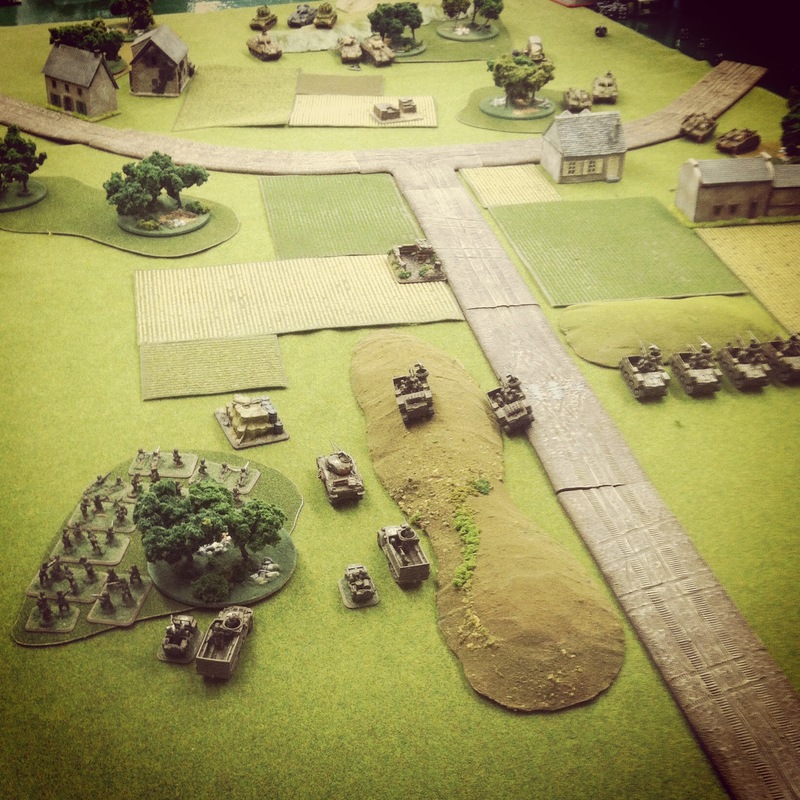 All the US armor and artillery was effectively shut-out of the game. As the Germans covered an objective, the American P-47 made one final run to force a German morale check but to no avail. The Germans had won the day. There were a number of things that had gone wrong for the Americans. 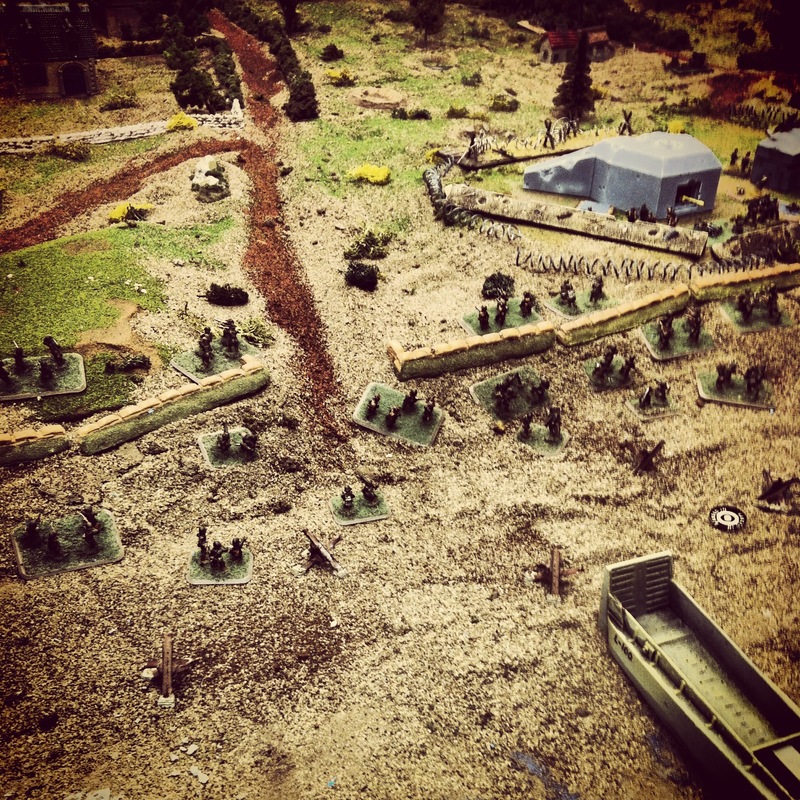 The rifle platoons never got out of the town, contributing almost nothing to the battle. Had they hauled their way toward the forest in the middle of the board, pressure would been greater on one of the objectives. The restrictions on the reserves also hurt the Americans, with nearly half their force never getting a chance to get in the fight. The US Airborne were typically deadly in their assaulting enemy armor and ground troops and proved to be the one positive for the Allies. On the German side of the table, much of its large armor platoon, including the Tiger, was sidelined for much of the battle as they navigated the hedgerows and roads. The game was a new experience for one of the German players who typically games in the wide-open spaces of the Northern Africa theater from earlier in the war. 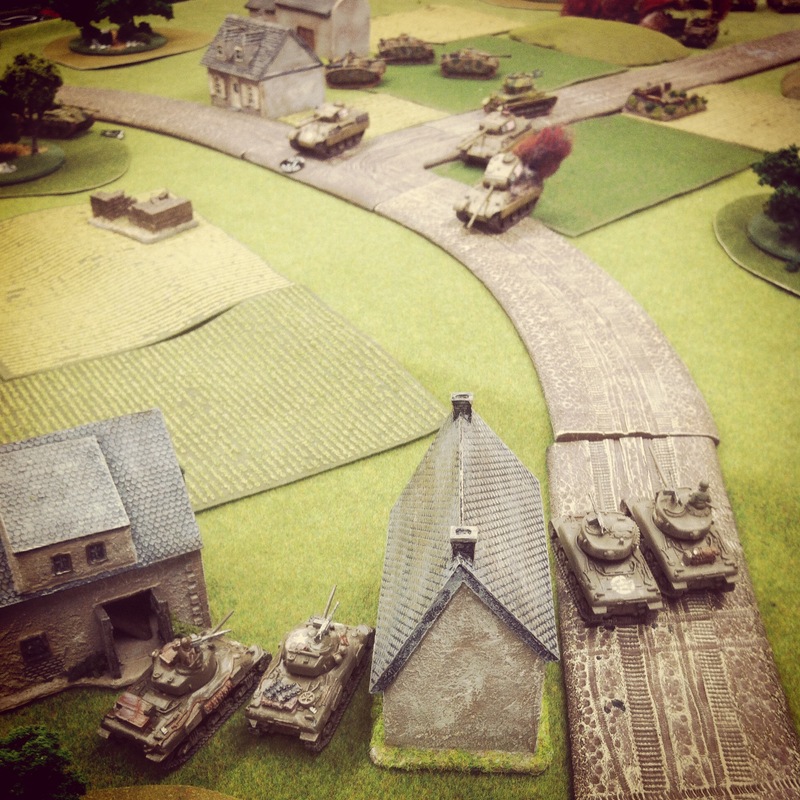 As in 1944, bocage played the role of a third unmovable enemy on the table. 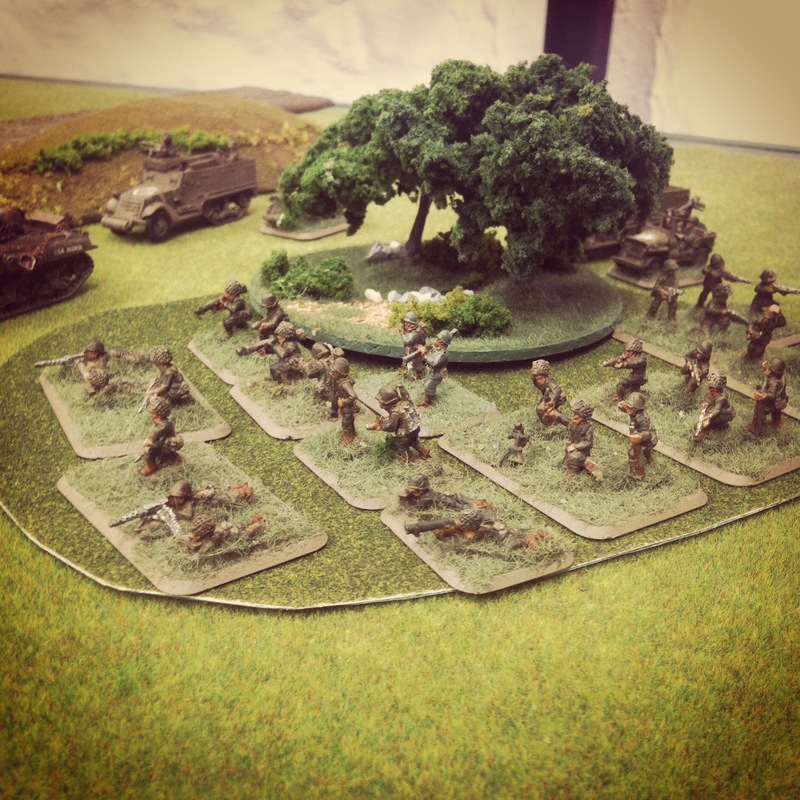 The bocage was frustrating for all players but this time sided more with the Germans in their breakthrough victory. The P-47 Thunderbolt was a big, heavy, expensive and deadly plane with .50-cal machine guns and a bomb payload of 2500 pounds. Rushed into development and production near the dawn of World War II, these American planes saw their first use in Europe in 1942. By the late war period, the P-47 was being widely used in Western Europe and proved to be among the most effective fighter aircraft in both air-to-air and air-to-ground combat operations. 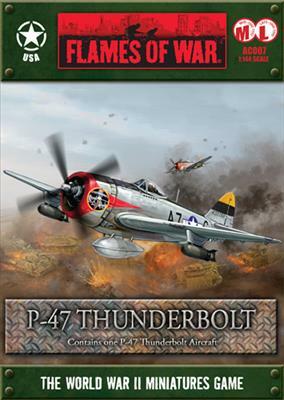 During the Normandy landings in June 1944, the German Luftwaffe was a virtual no-show and the P-47 Thunderbolt ruled the air in support of the massive Allied invasion below. 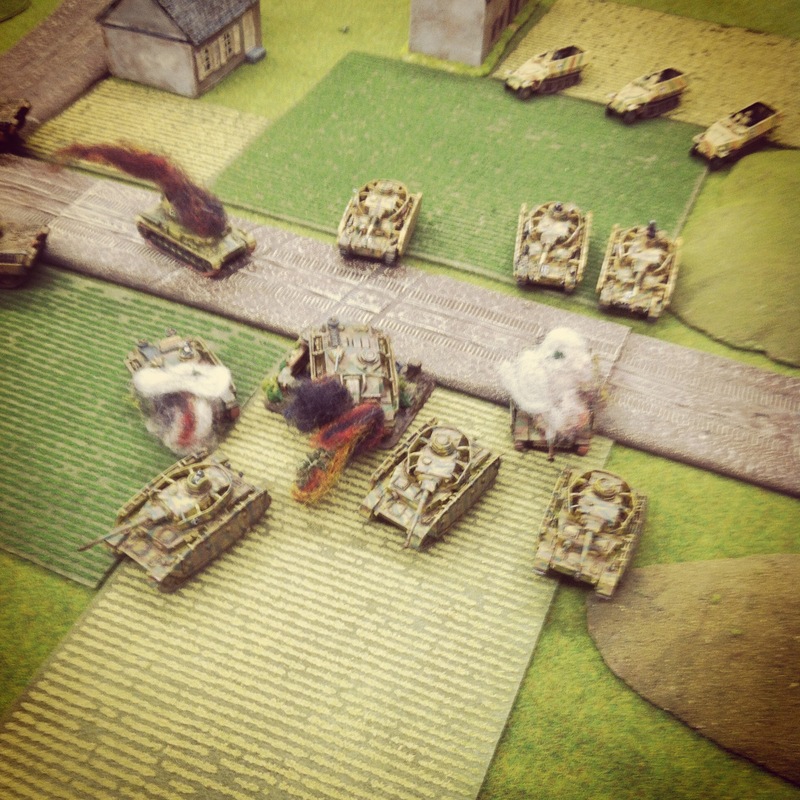 I’ve been modelling and playing with the 15mm World War II Flames of War miniatures wargaming system for a number of years now, but until now all my gaming has been with tiny scale boots, wheels and tank tracks firmly planted on the ground. 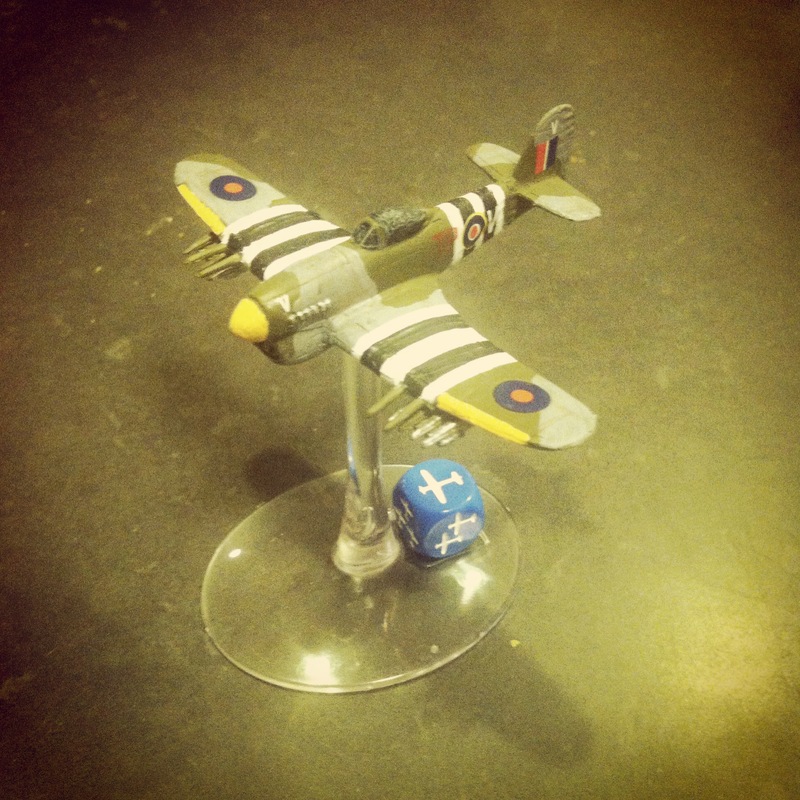 With a full afternoon of large 2500-point late war period FOW games being planned in July at Metropolitan Wargamers in Brooklyn, I decided to supplement my existing US Airborne force with some new air support with a P-47 Thunderbolt model. Armed with its wing machine guns and laden with bombs, I’m pretty excited about adding the P-47 and a whole additional dimension to a game I’ve gotten pretty familiar with over the years. Choosing a paint scheme for the model was the first decision I needed to make in my project, and there are hundreds of historical variations to be found. While the silver fuselage seemed to be among the more commonly-modeled versions of the P-47, I opted for a simpler olive drab body. The green base coat was followed by a grey underbelly and some boldly-colorful red details at the nose and tail. The windowed canopy “glass” consisted of some flat black and white dry-brushing. Along the seams in the body of the plane I wiped fine lines of rusty metal to show wear on the plane. The decals included in the kit completed the model, albeit with a fair amount of struggle with near-miss tears. While my first shot at modelling a plane for FOW may not be 100% historically accurate, I’m pretty satisfied with the visual impression it makes. At some point I’ll even things up with a German plane, but for now I can’t wait for my P-47 to take off in my next game.